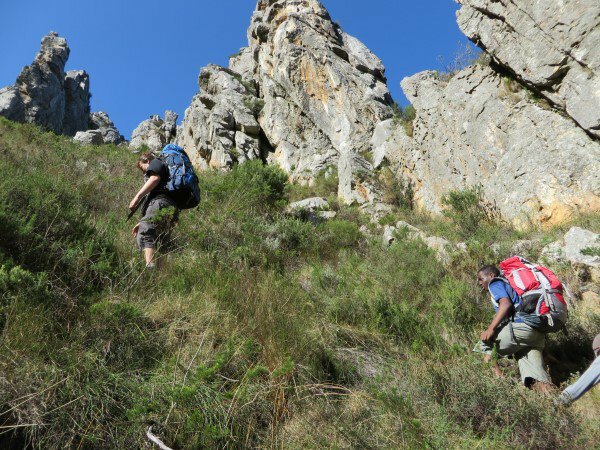 To do this hike you must be hiking fit. 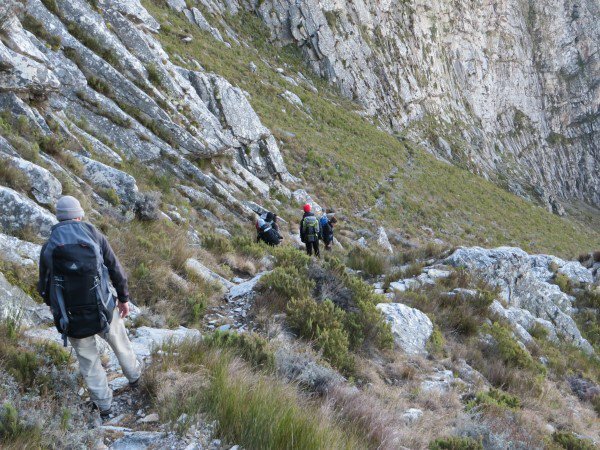 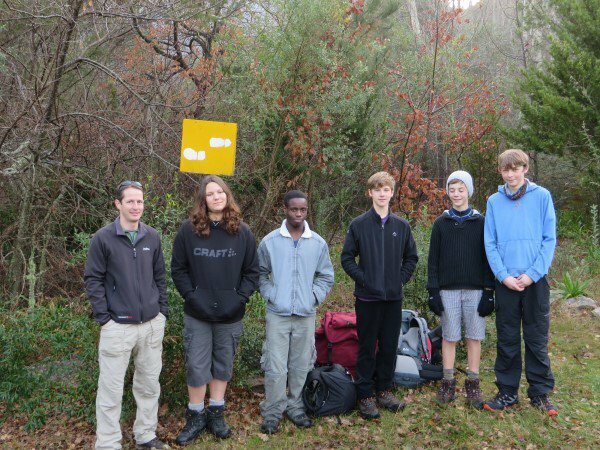 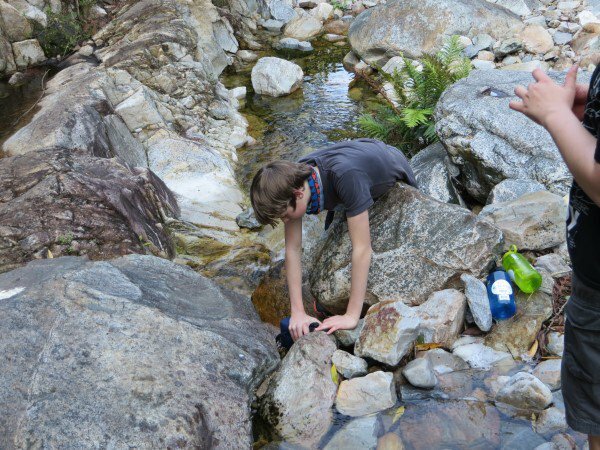 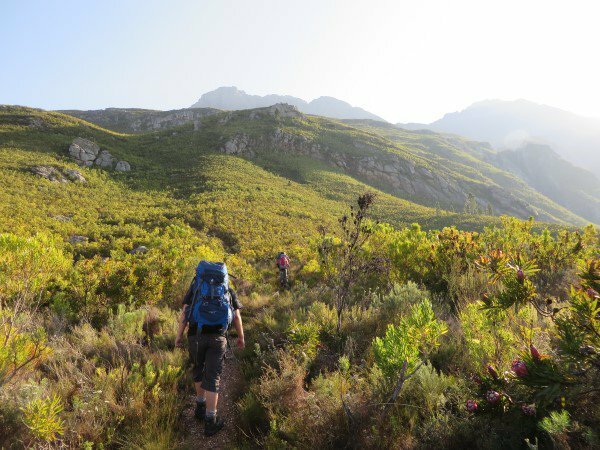 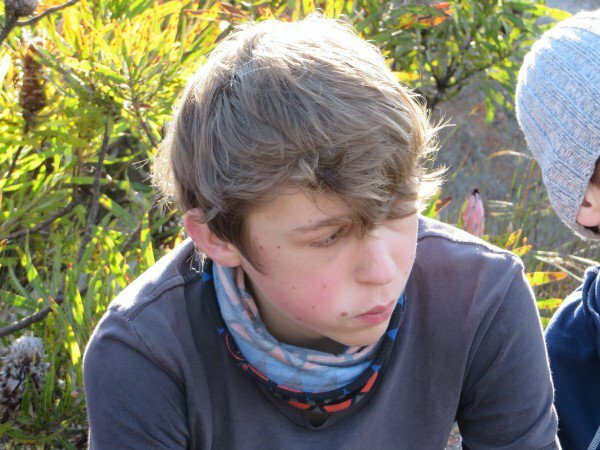 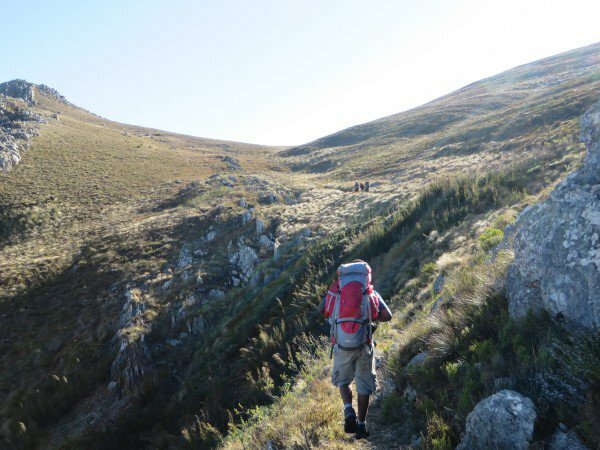 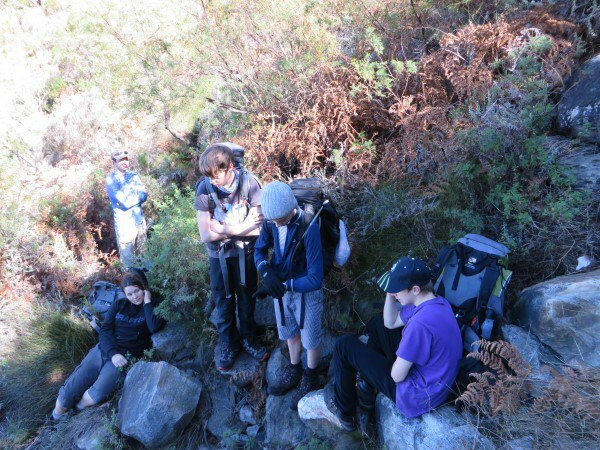 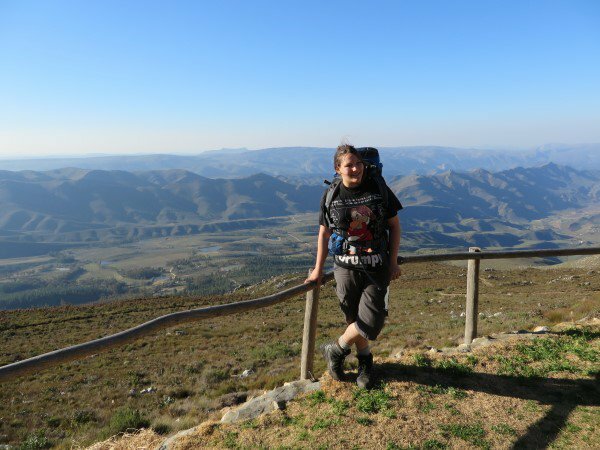 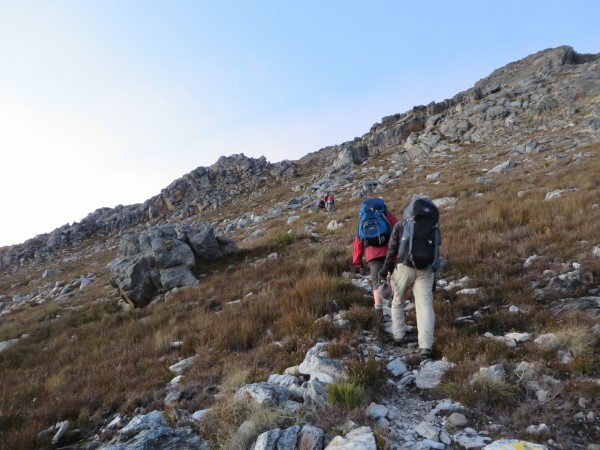 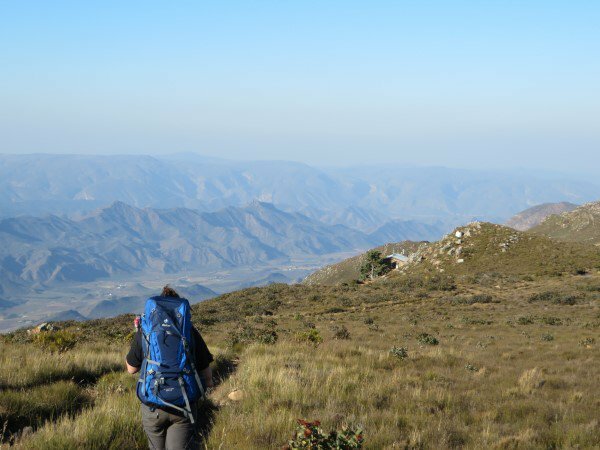 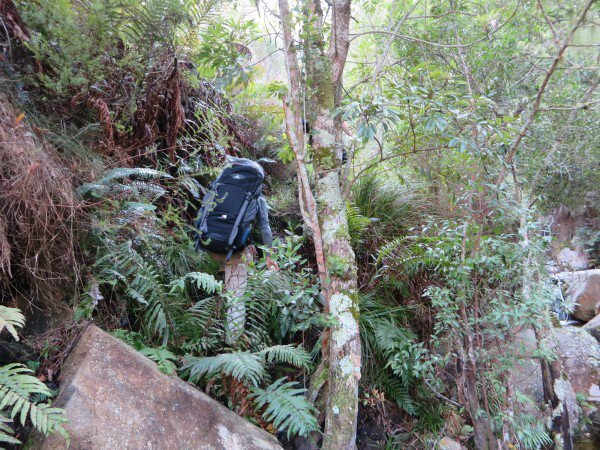 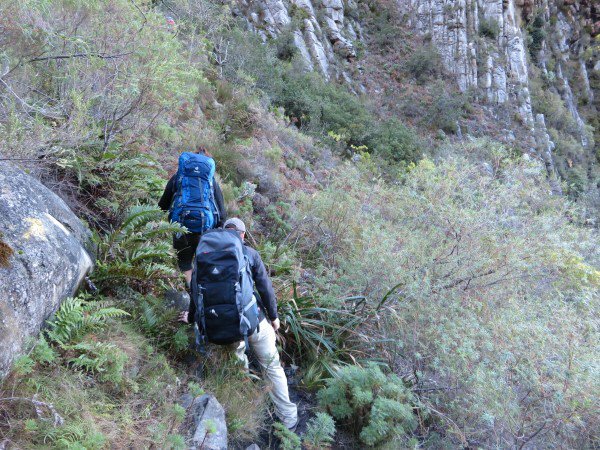 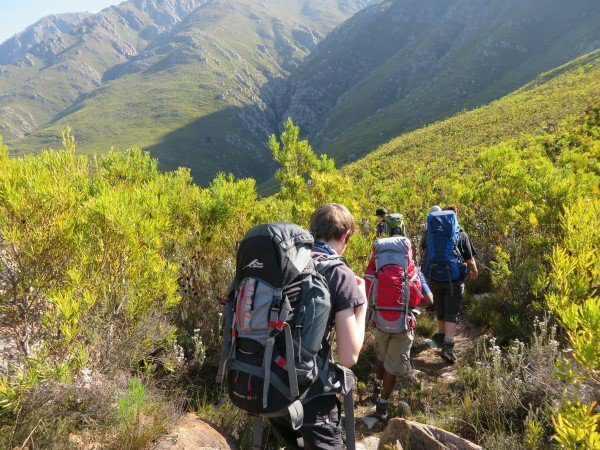 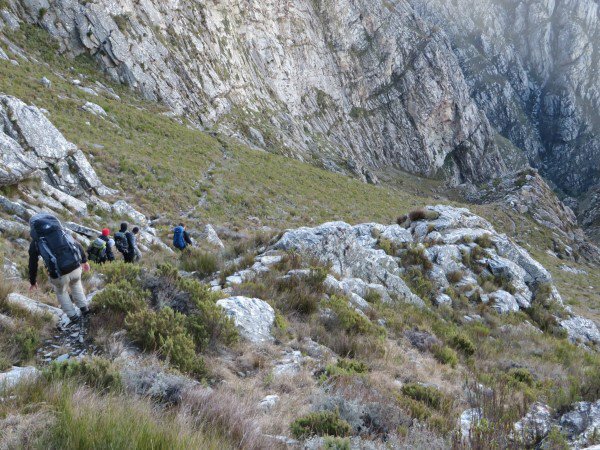 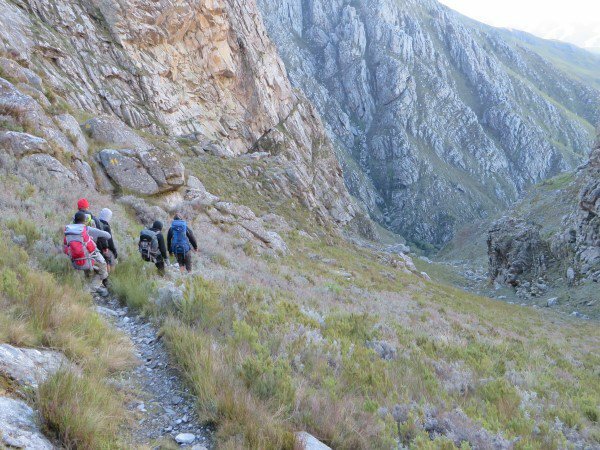 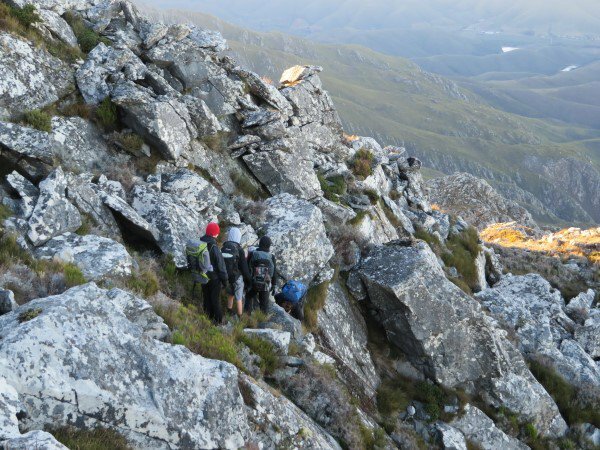 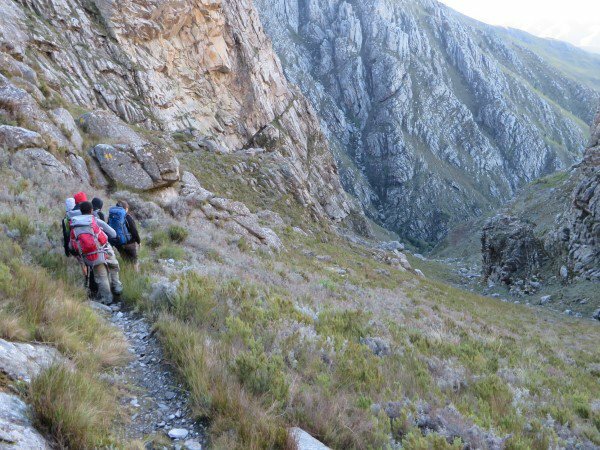 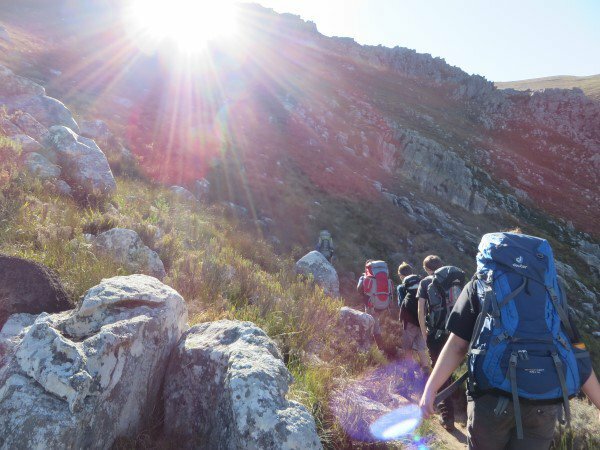 Packing light makes this hike much more pleasant than would otherwise be the case so a good understanding of equipment and light food is important. 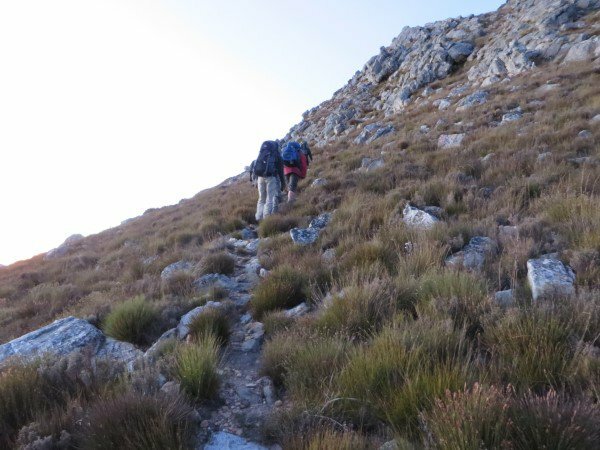 Boots are absolutely essential and it would not be advisable to do this hike without good ankle support. 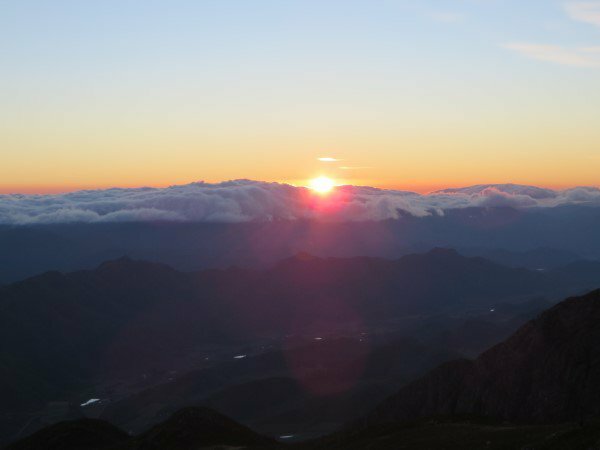 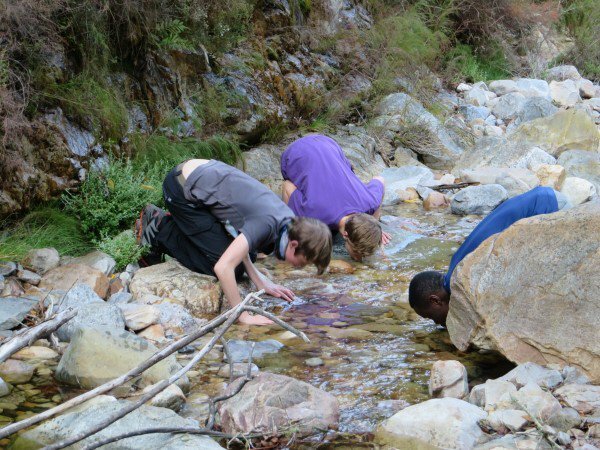 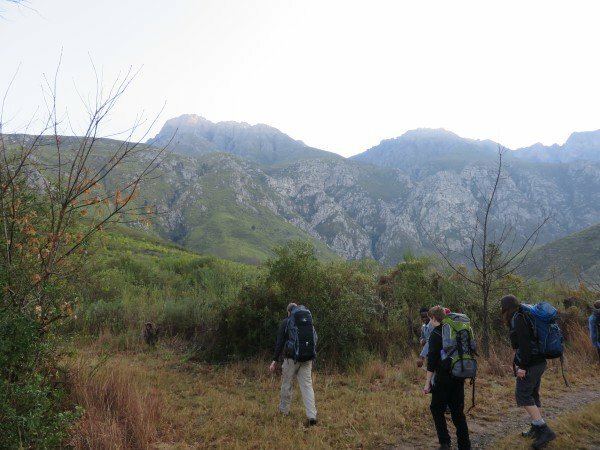 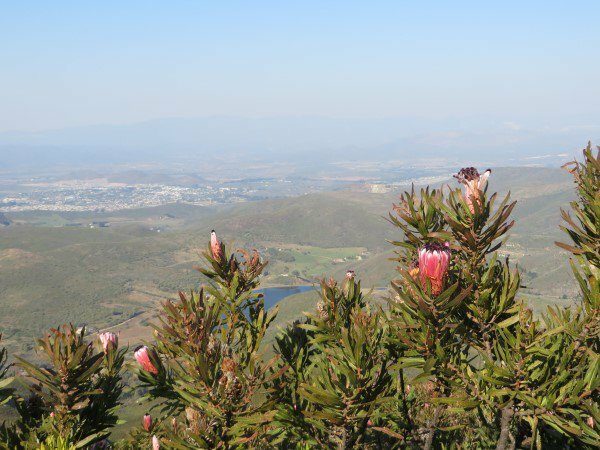 We drove through early on Saturday morning in August 2014 to Dassieshoek Reserve near Robertson, arriving at about 8:30. 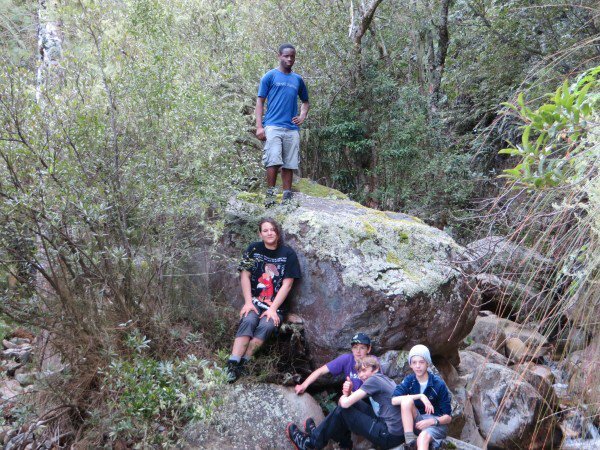 We started hiking at about 8:50 and hit the first up less than 5 minutes later. 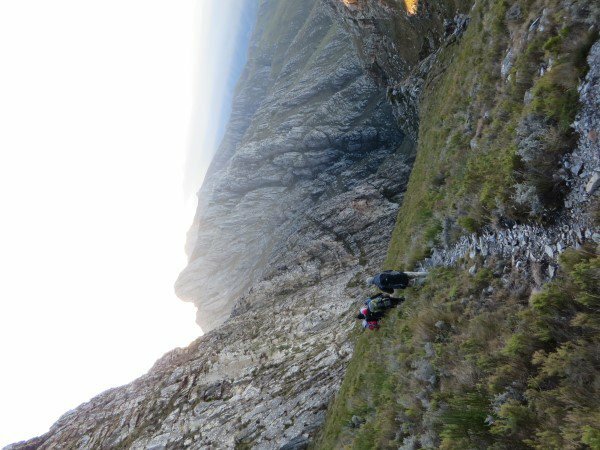 That would be pretty much the last level path we would see until the end of the day. 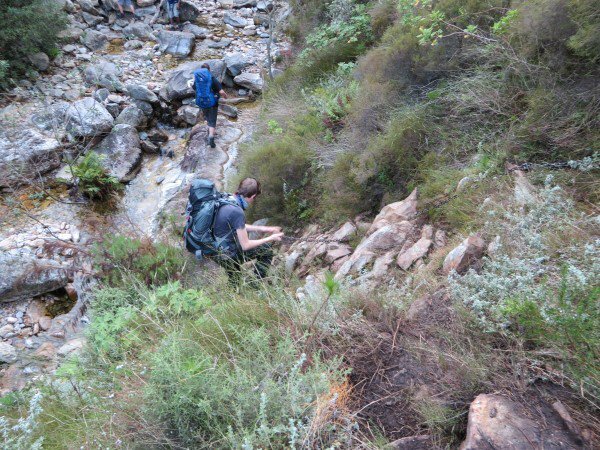 The path is clear and easy to follow and trends almost continuously up; with just one or two places where there is a down to cross a river. 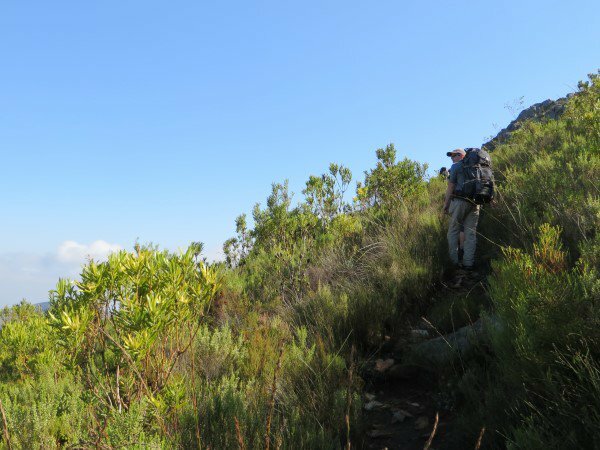 There is not much to do except trudge upward at a steady pace, admiring the view, the proteas and the birds and looking hopefully up to see how close the top is. 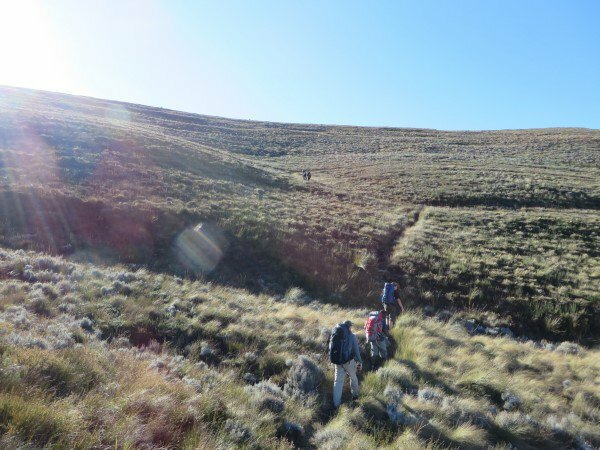 We reached the hut in almost exactly 7 hours – precisely the time indicated on the map. 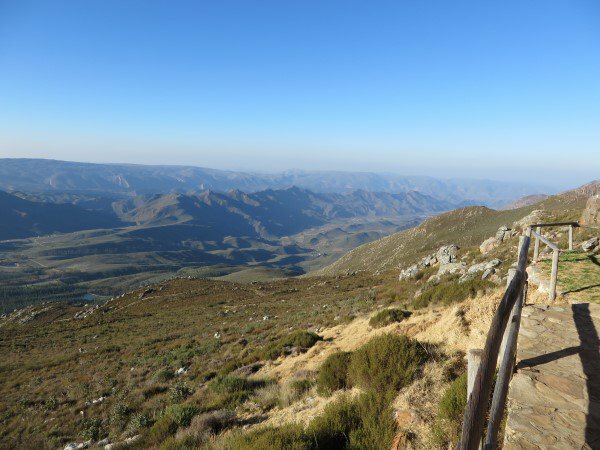 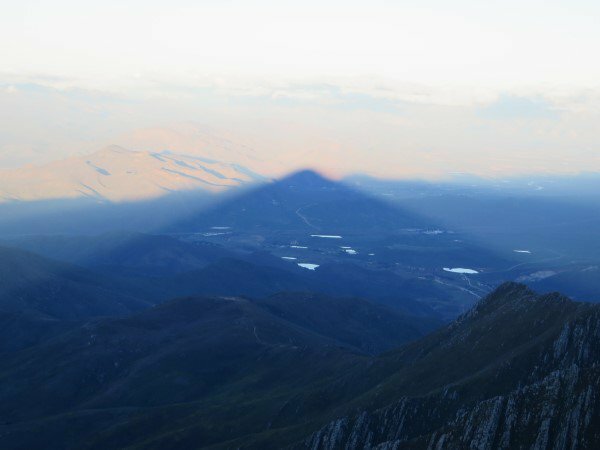 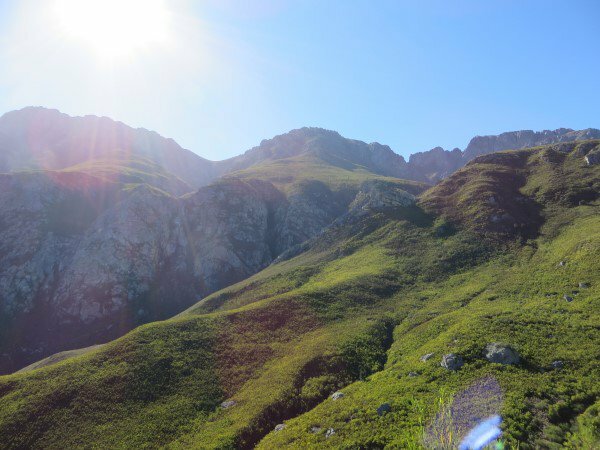 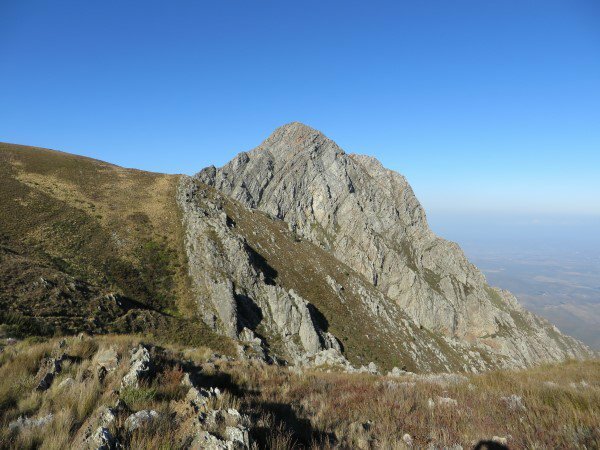 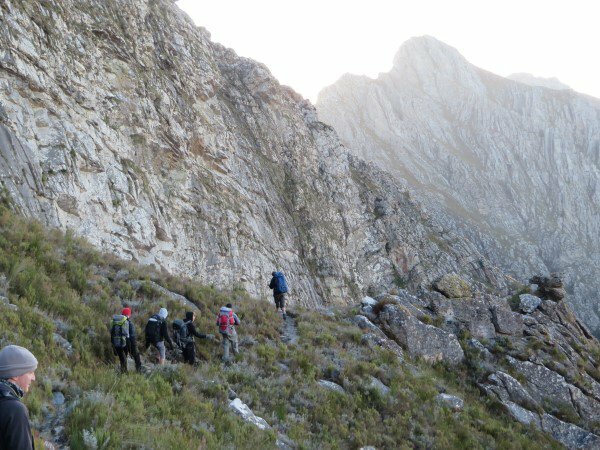 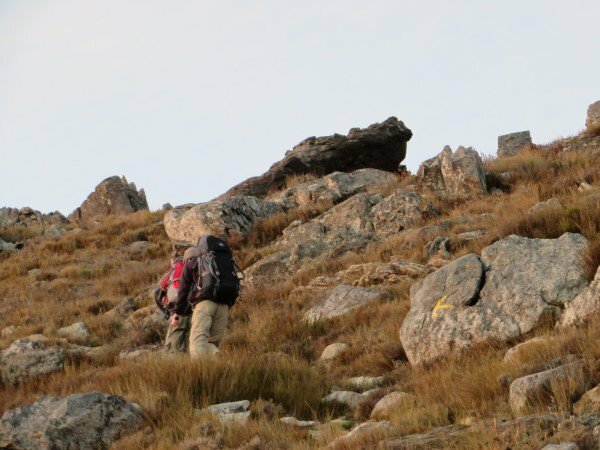 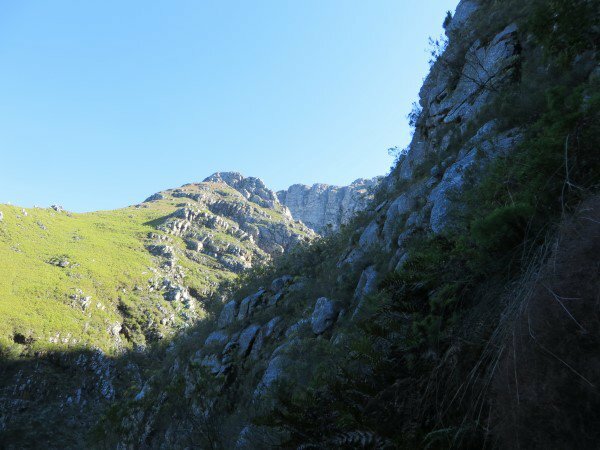 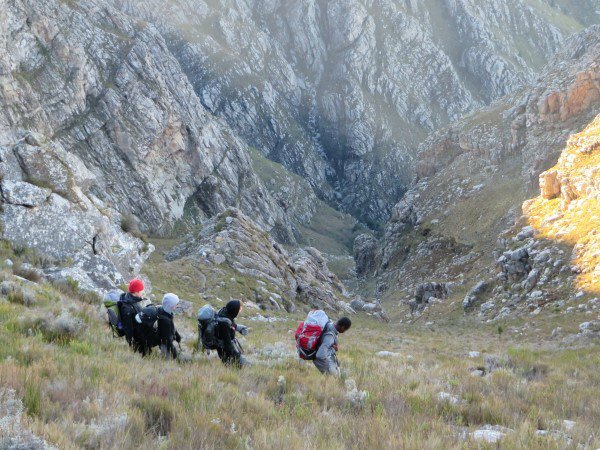 The incline gets steeper towards the end of the day, passing through rock formations until it smooths out into rolling grass on the top of gully between the two peaks (Arangieskop is on the right). 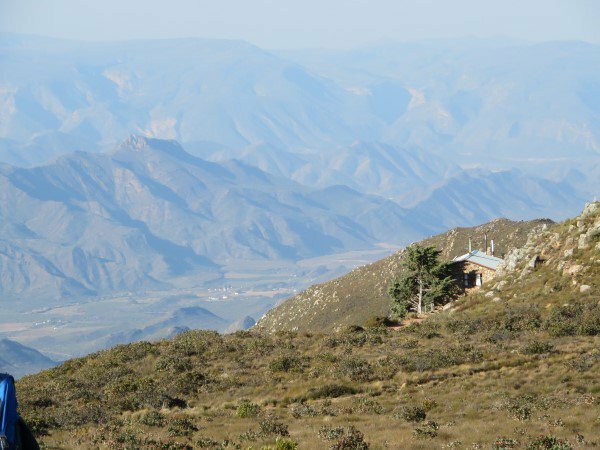 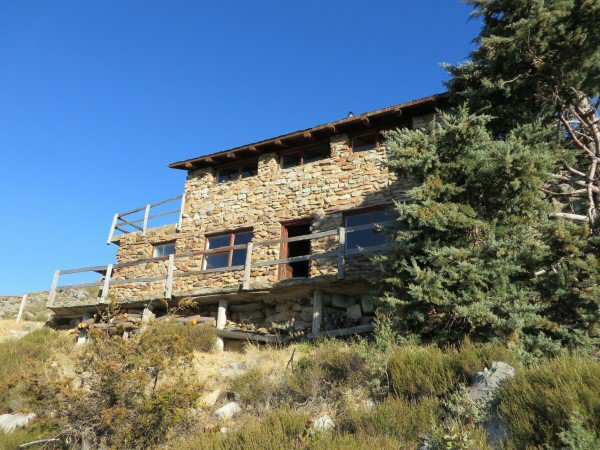 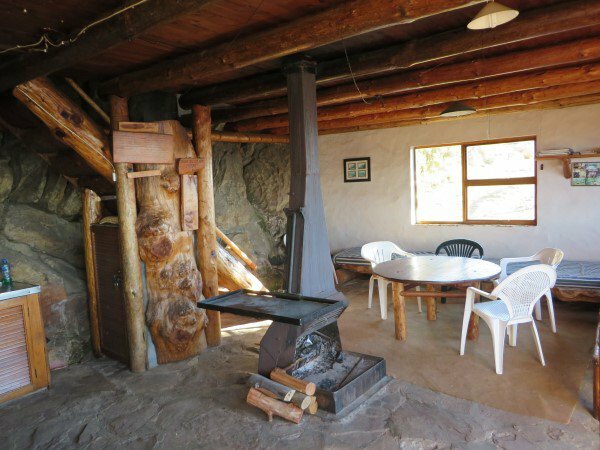 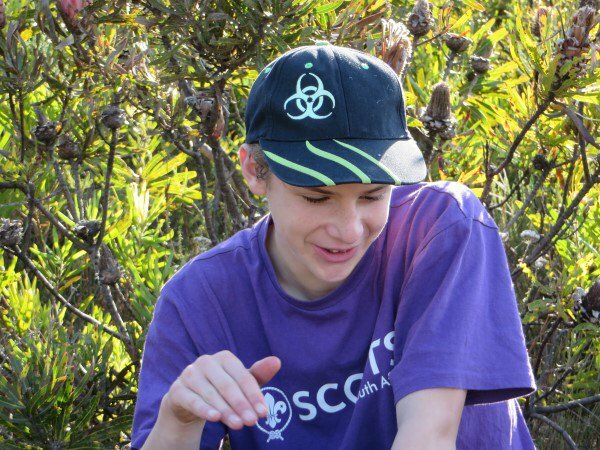 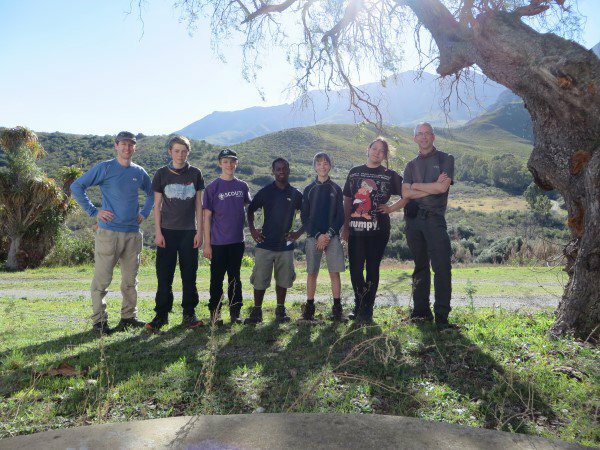 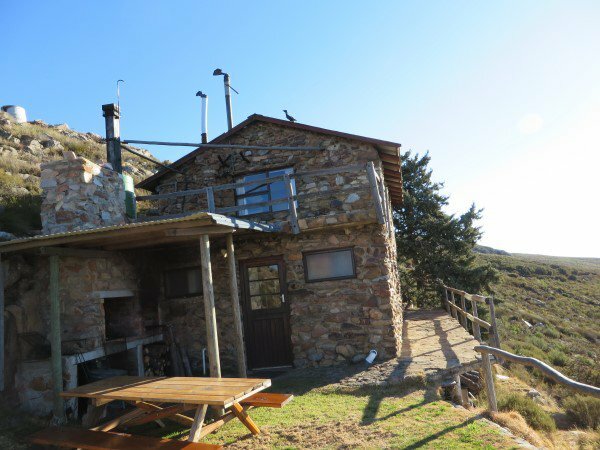 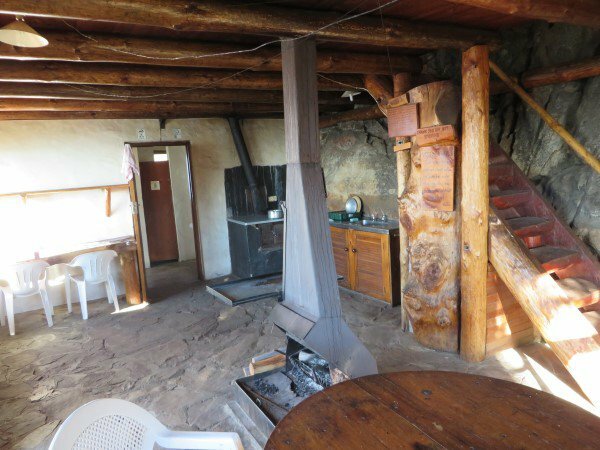 The overnight is a fantastic hut with views over the Koo Valley. 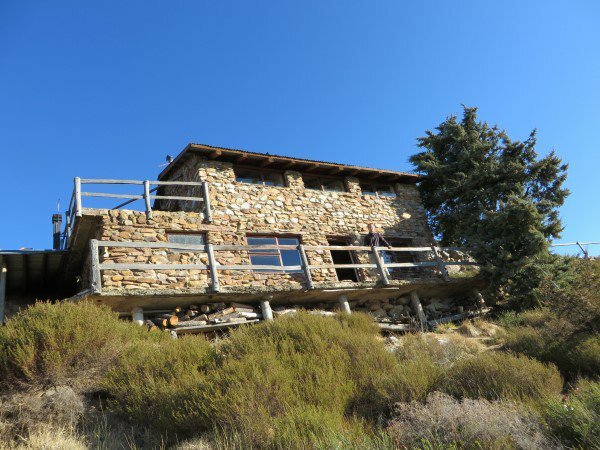 It will probably need some maintenance at some point but as it stands now, everything works, the views are wonderful and the beds are just waiting to welcome weary bodies. 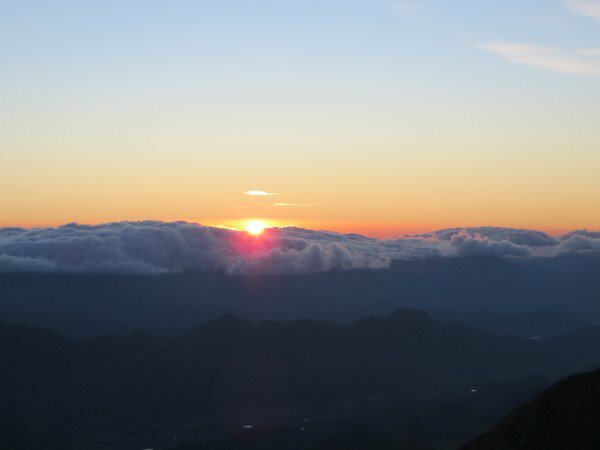 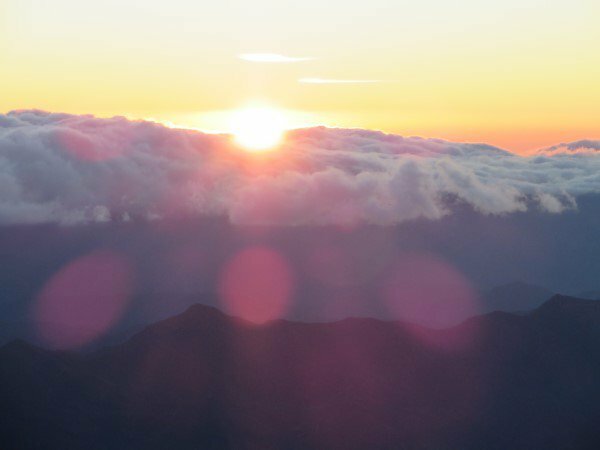 We started the next day early but not quite early enough to catch the sunrise on the summit, missing this by about 10 minutes. 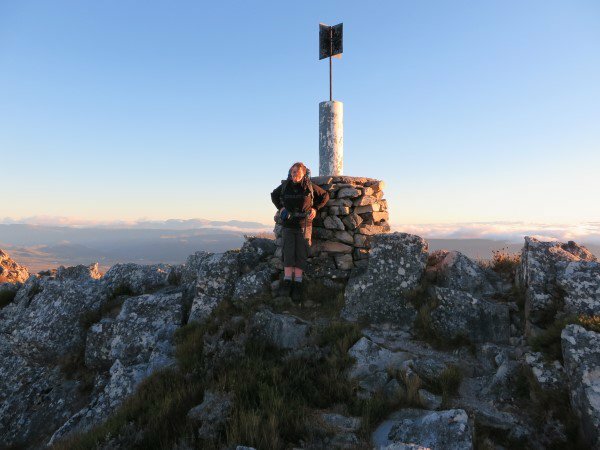 The summit was windy and cold and we started down at 7:50. 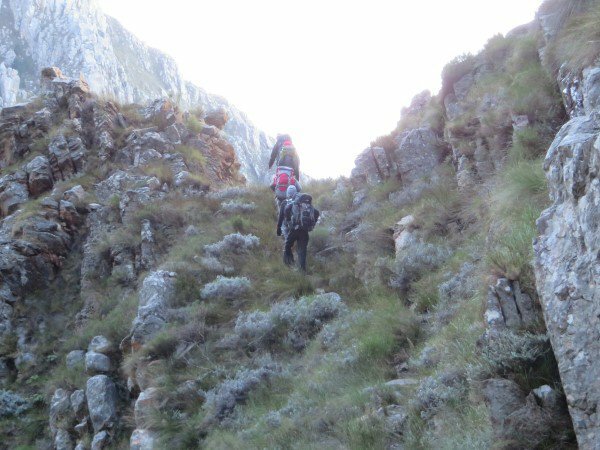 It rapidly became apparent that this would be an epic descent. 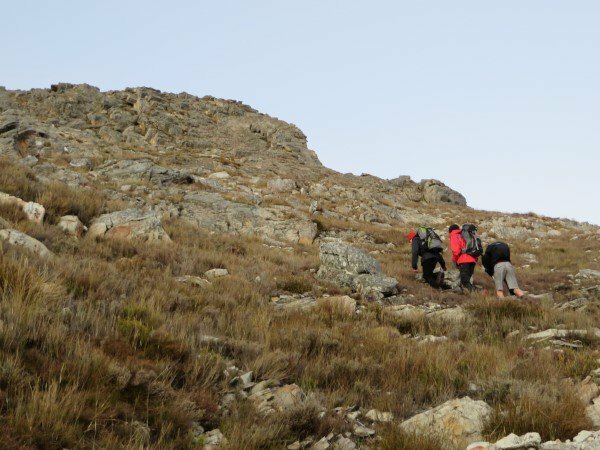 It was also clear that doing this hike with ice on the rocks would be an incredibly dangerous experience which would slow any descent by several hours. 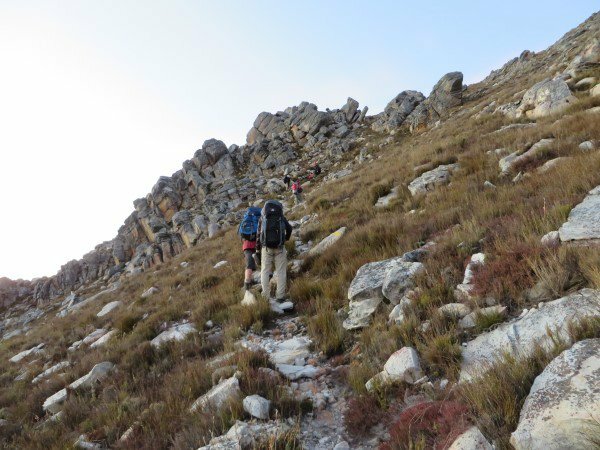 It is thus not advisable to do this hike in winter but rather in spring or autumn. 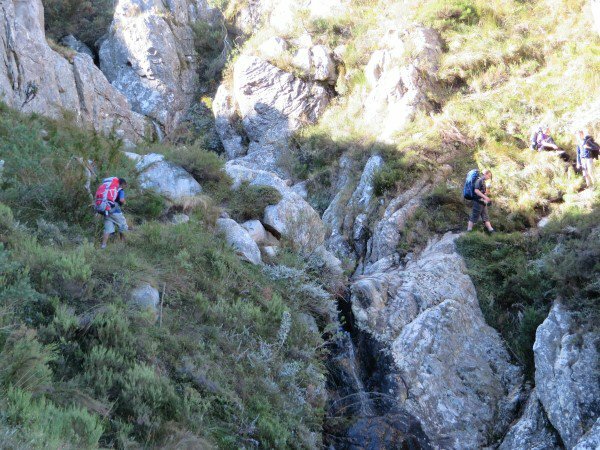 The descent in total took 6.45 hours, a little longer than expected. 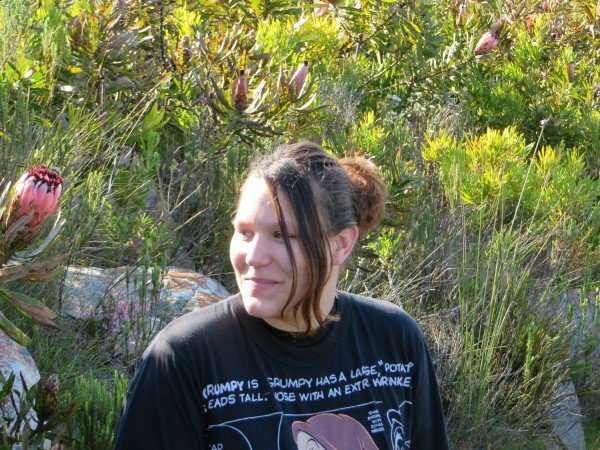 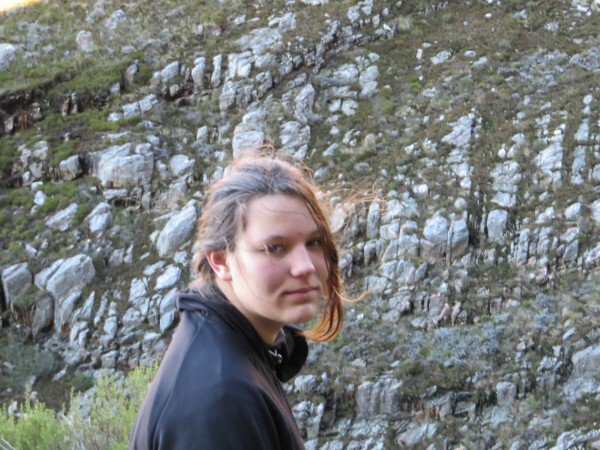 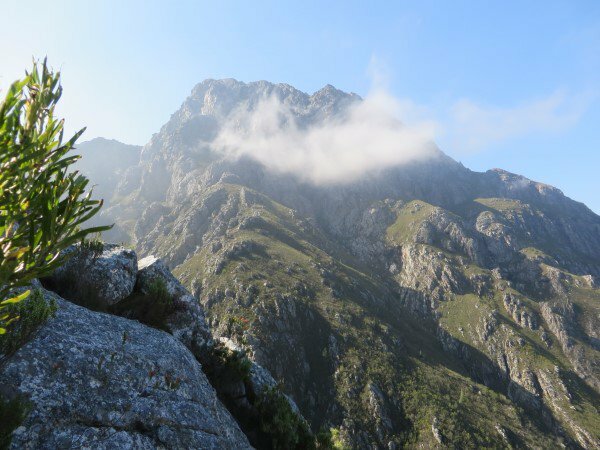 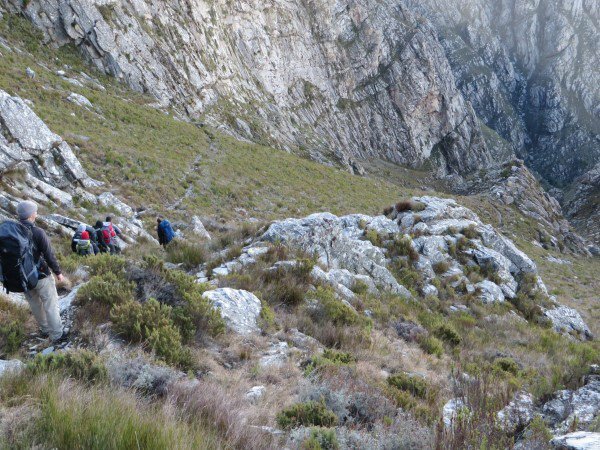 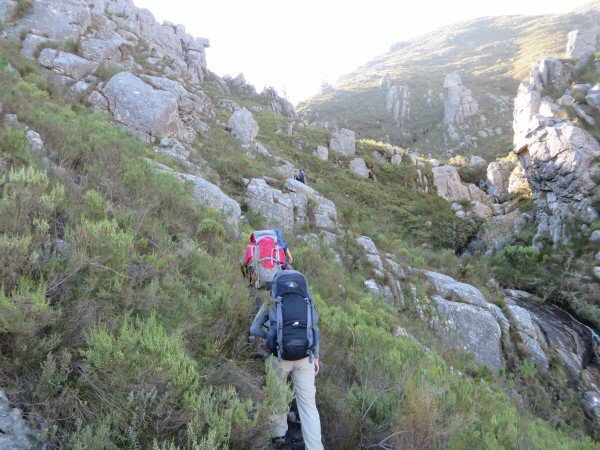 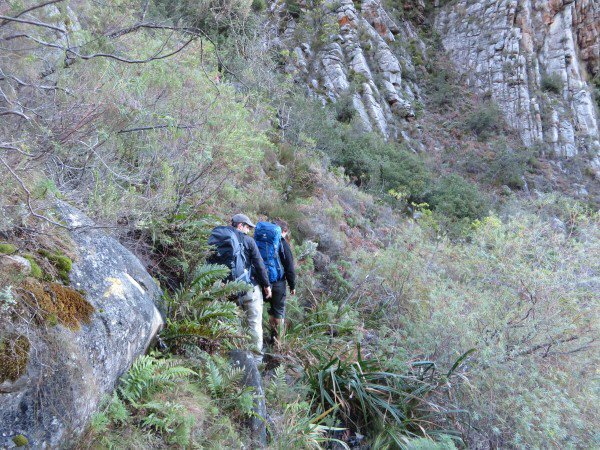 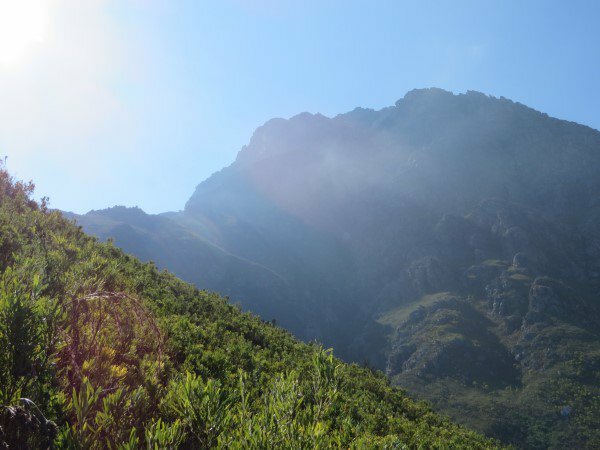 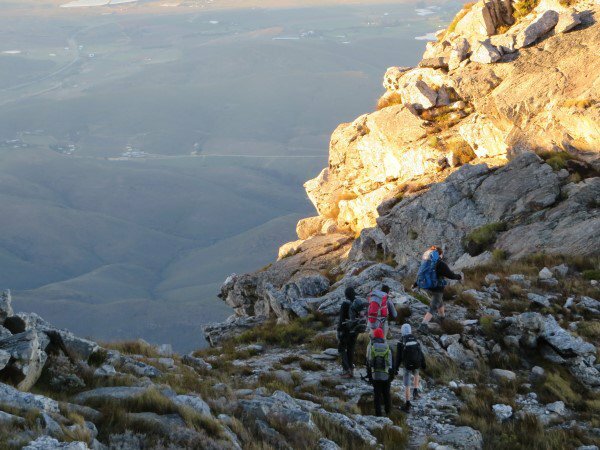 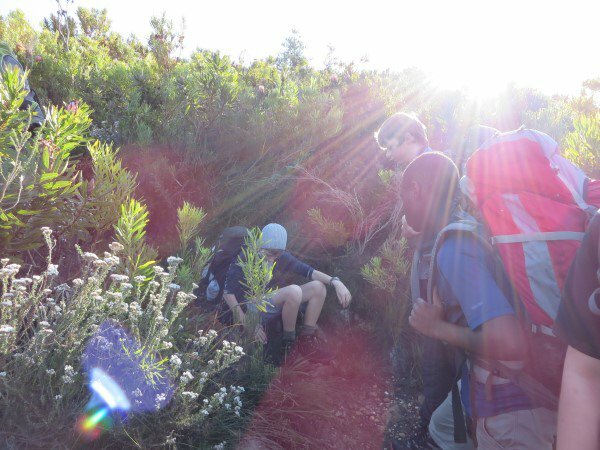 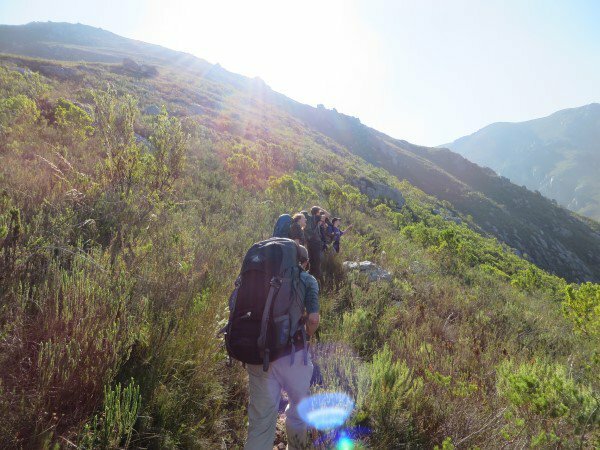 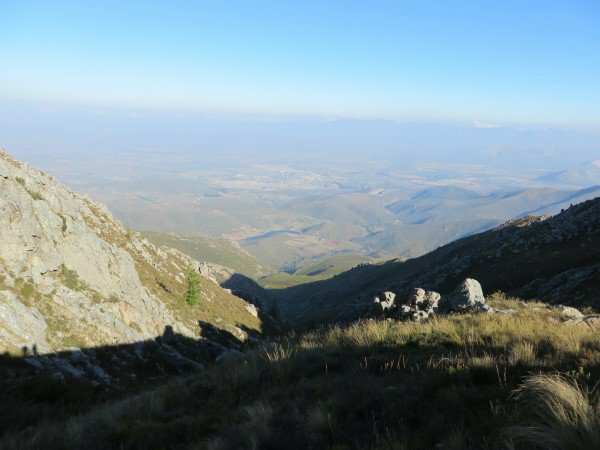 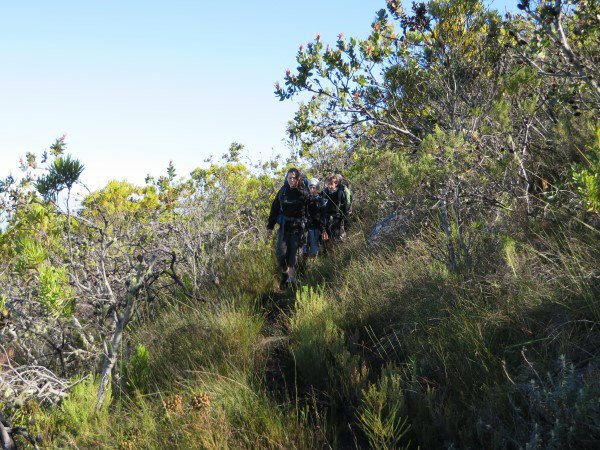 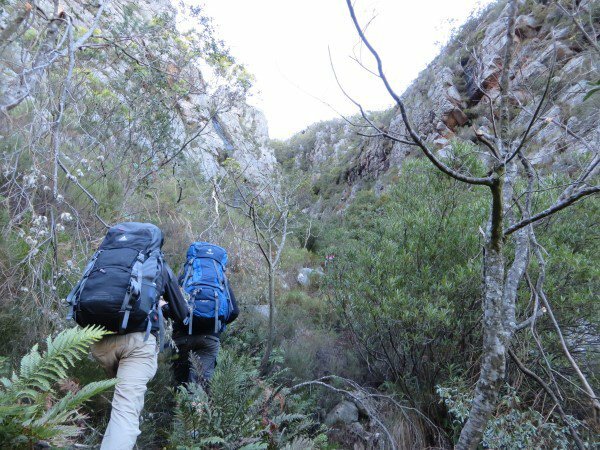 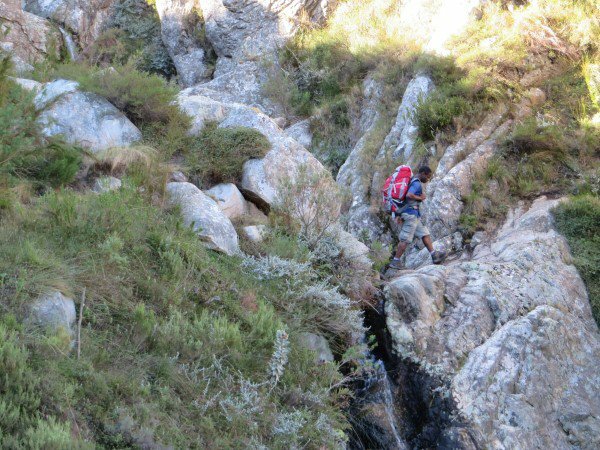 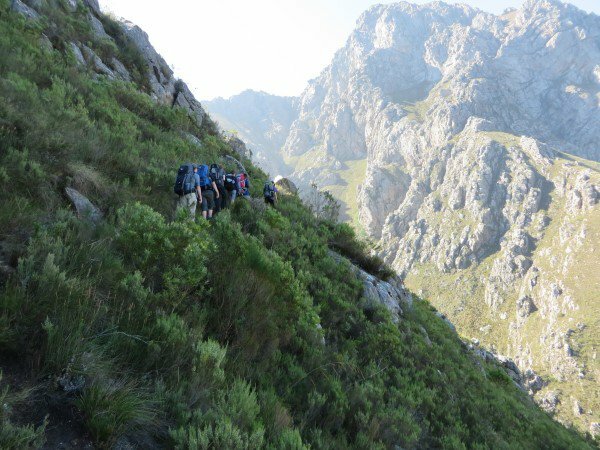 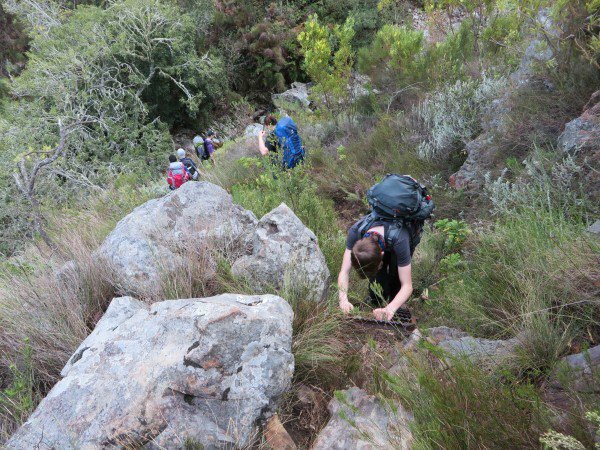 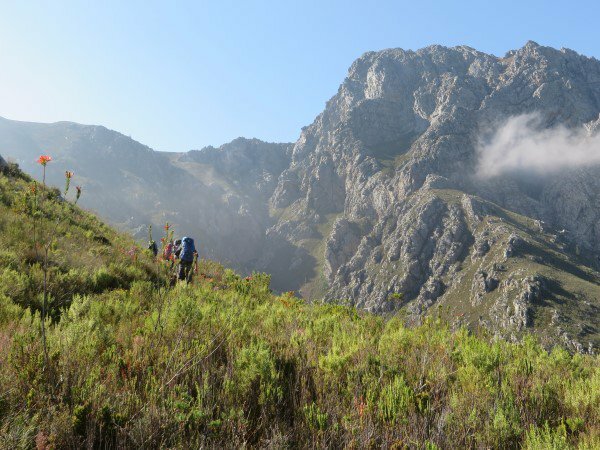 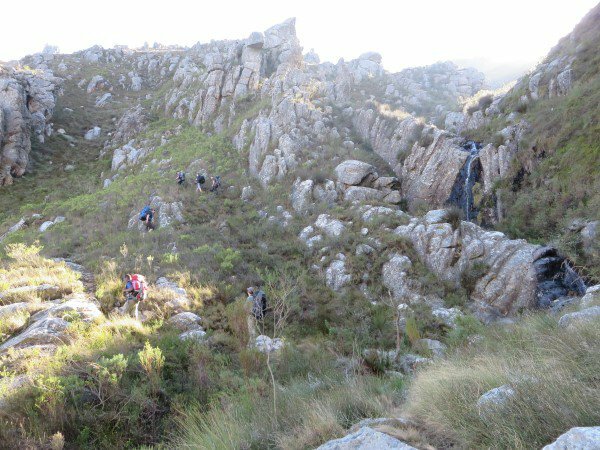 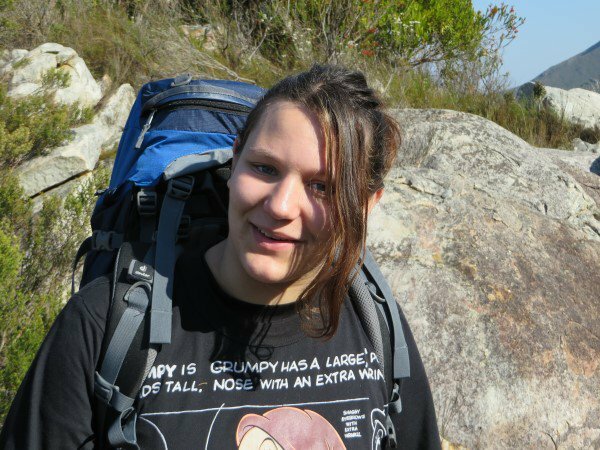 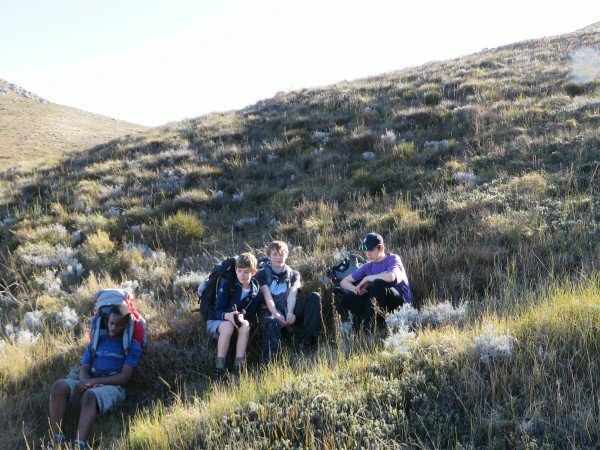 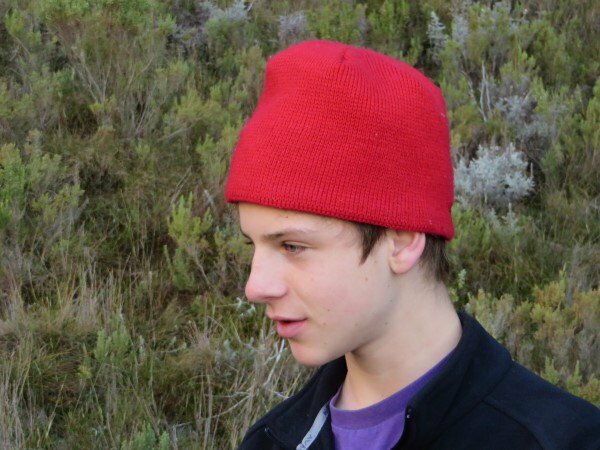 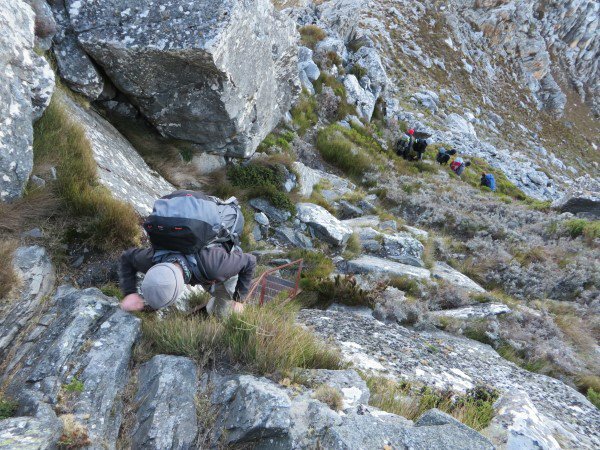 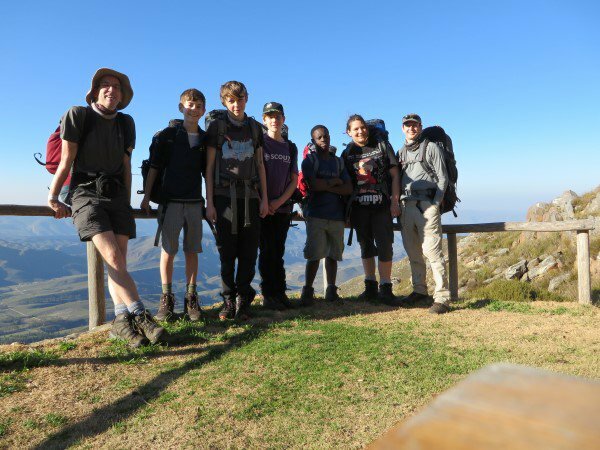 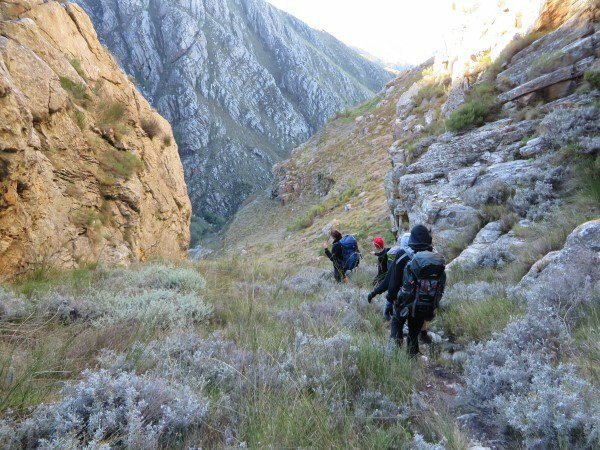 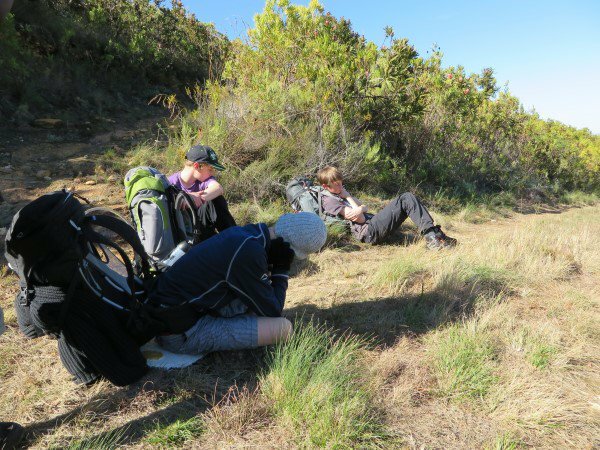 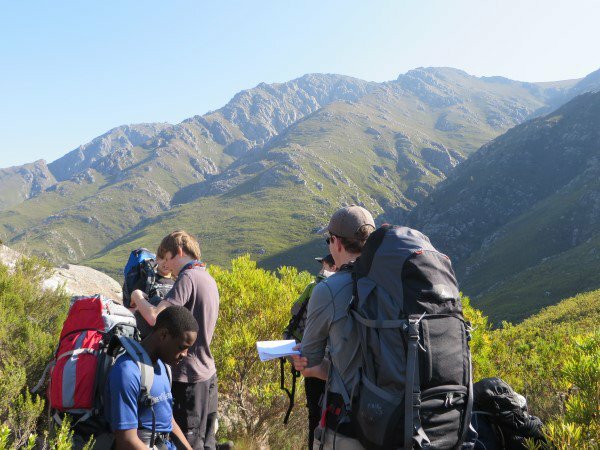 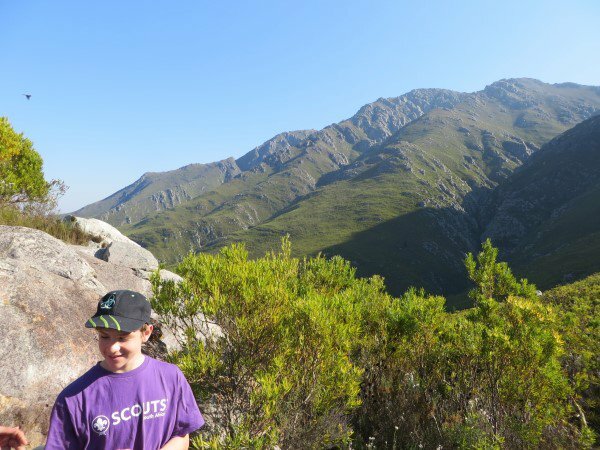 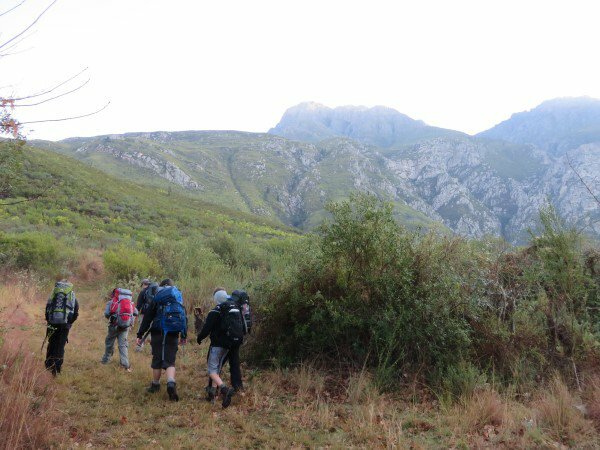 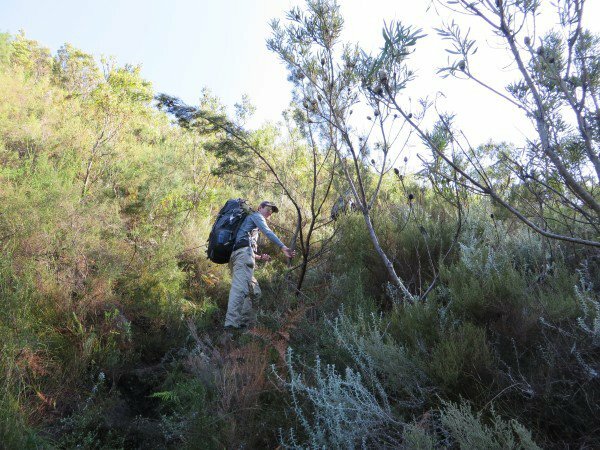 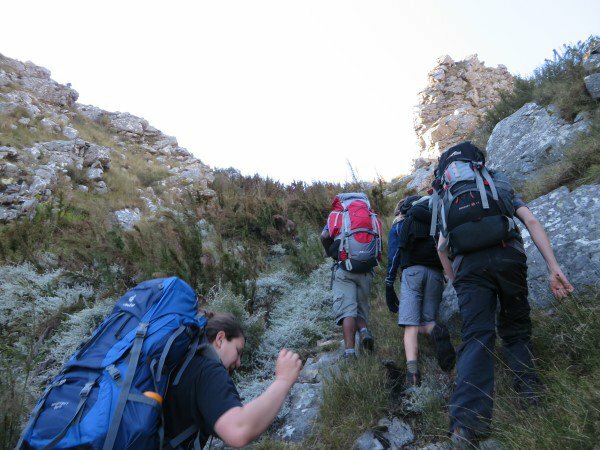 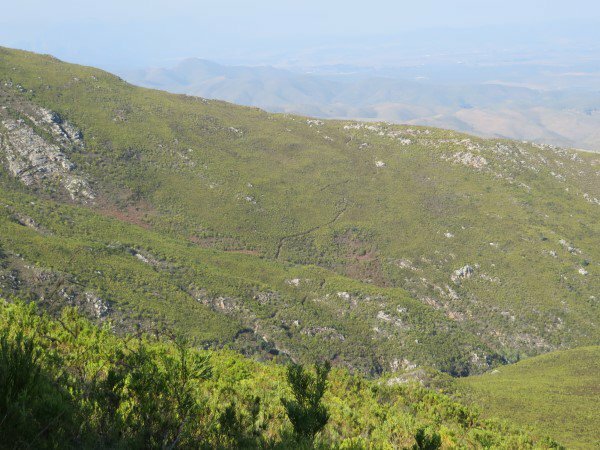 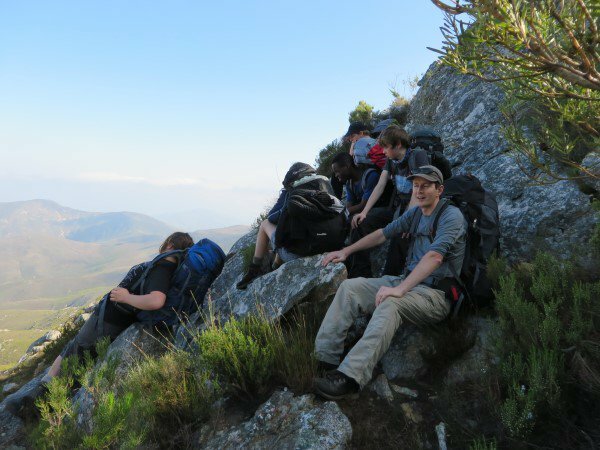 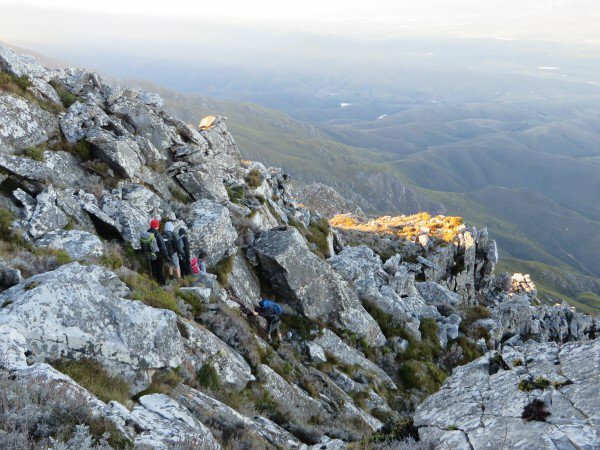 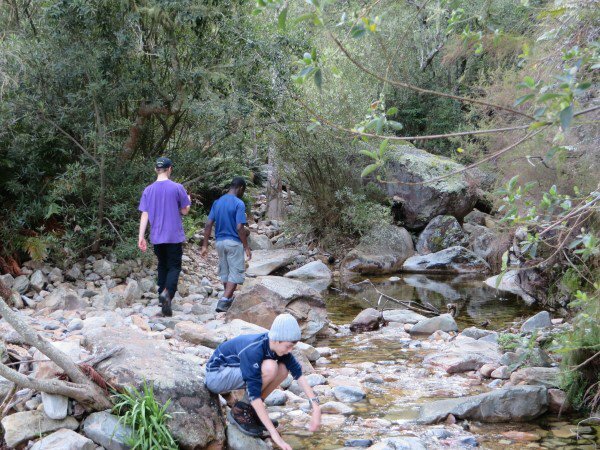 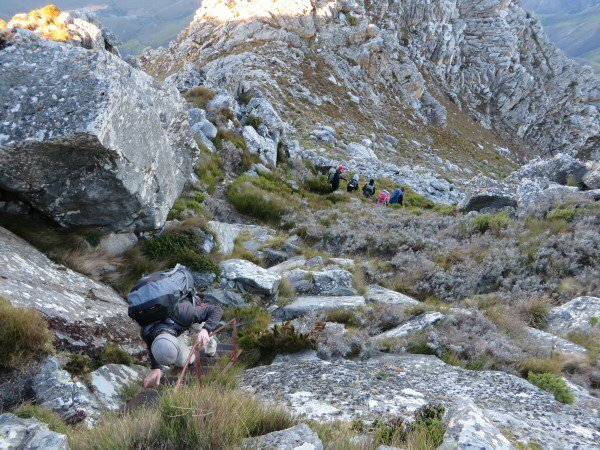 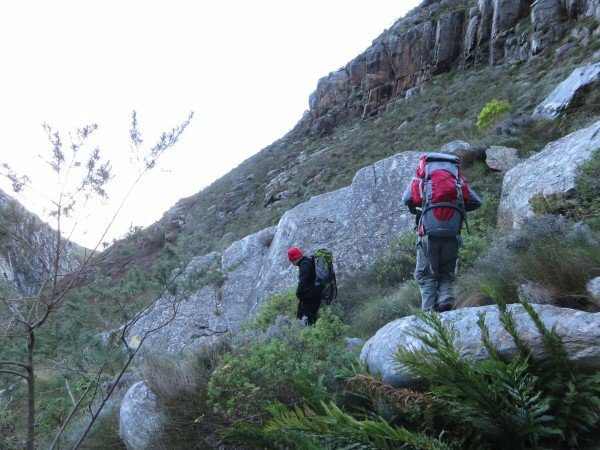 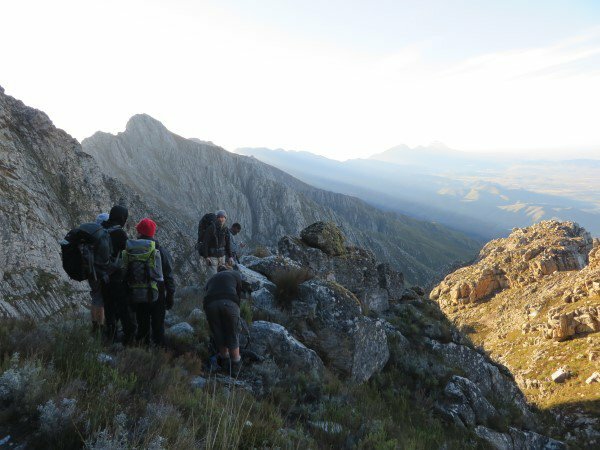 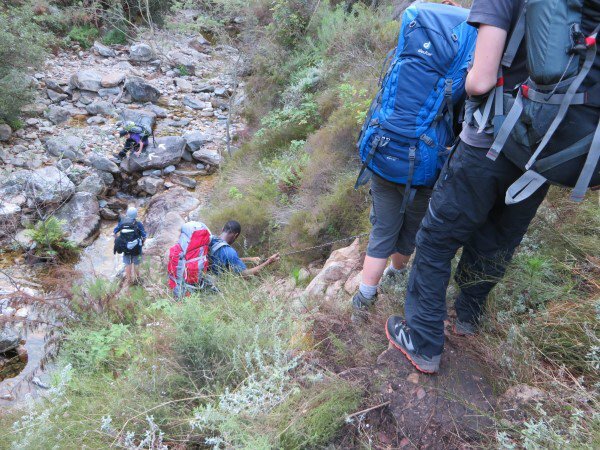 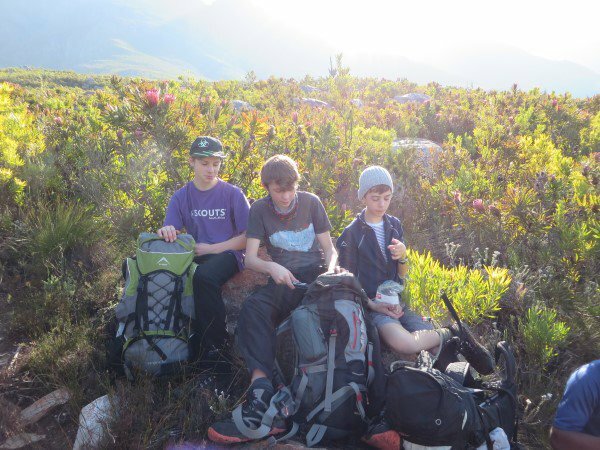 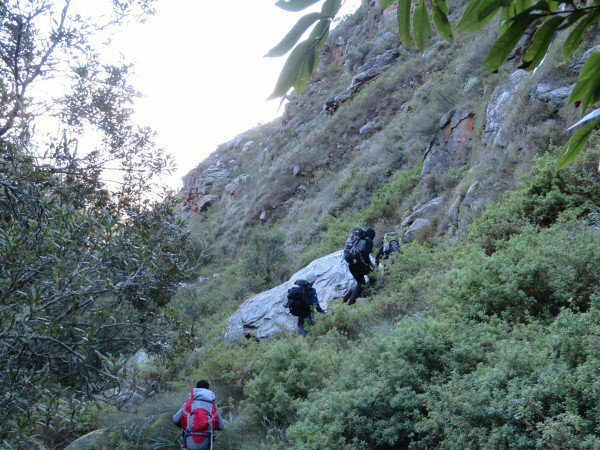 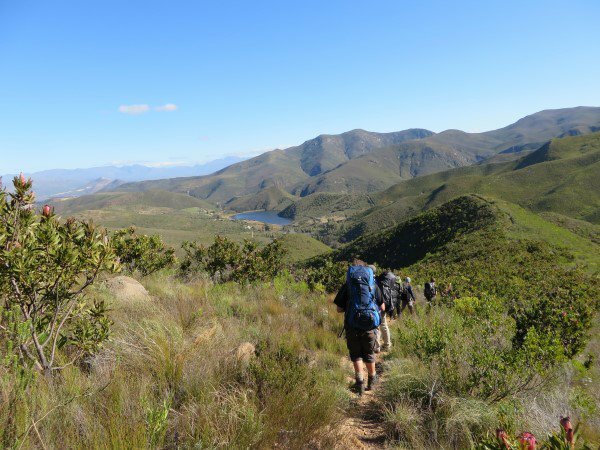 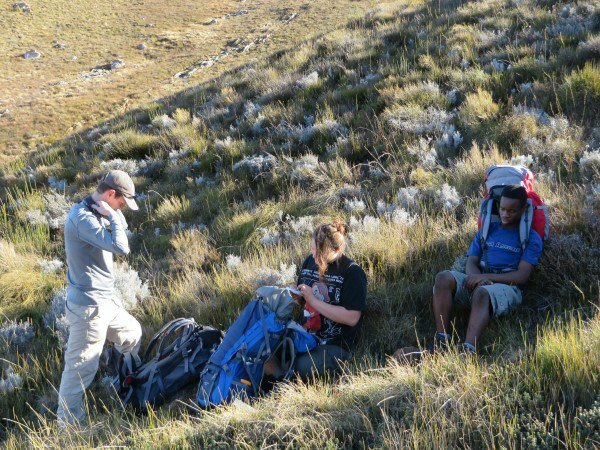 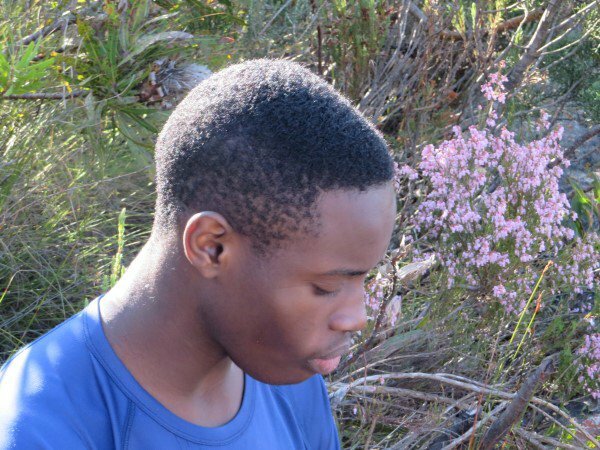 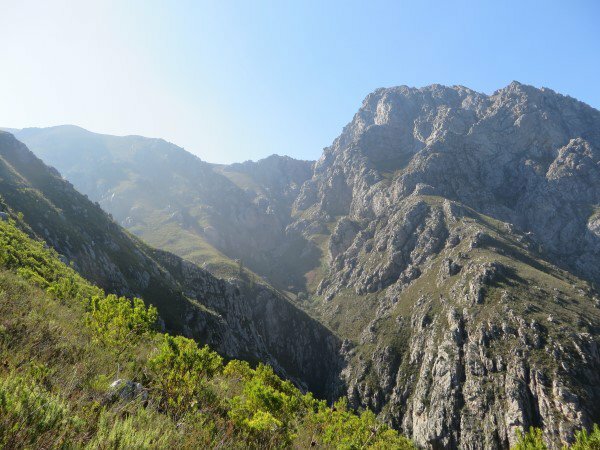 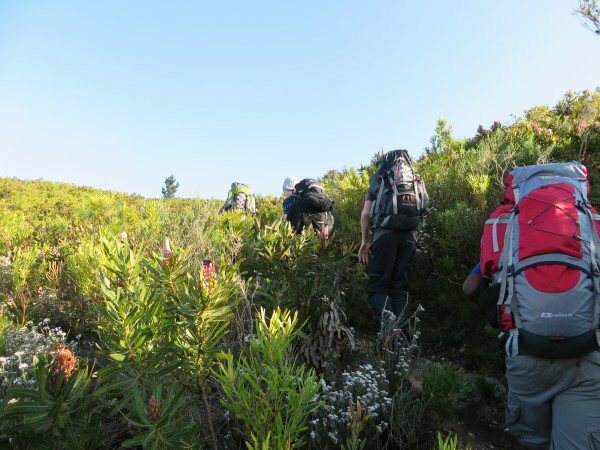 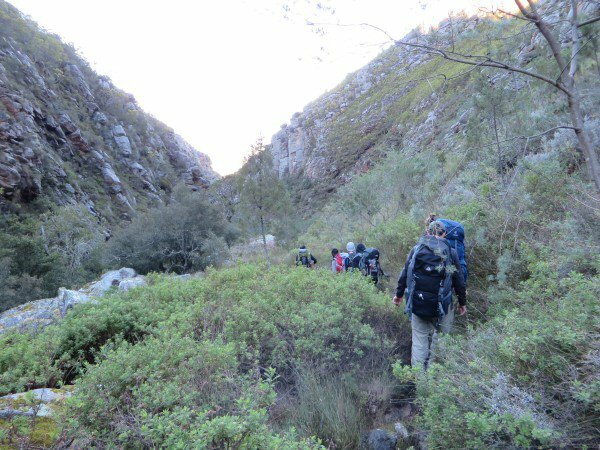 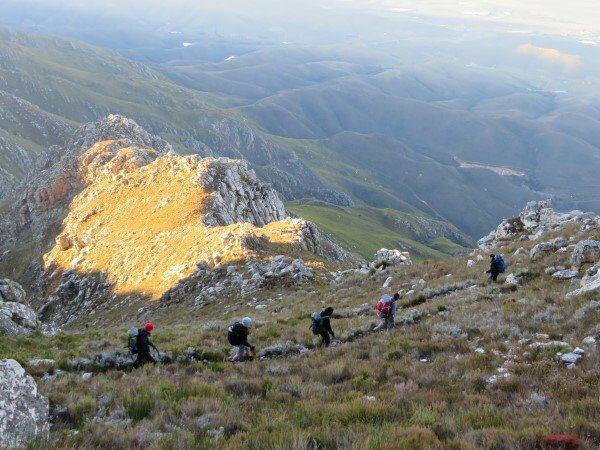 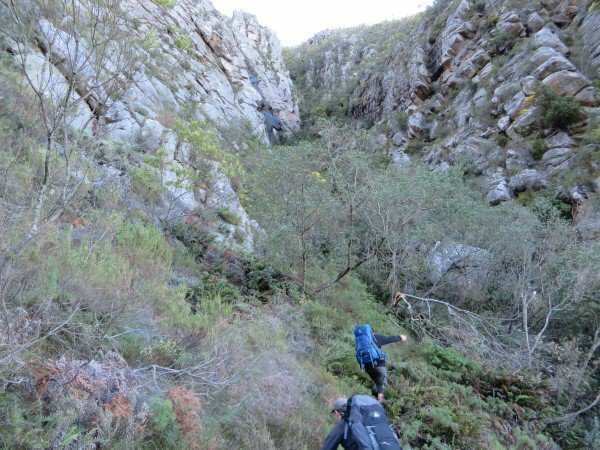 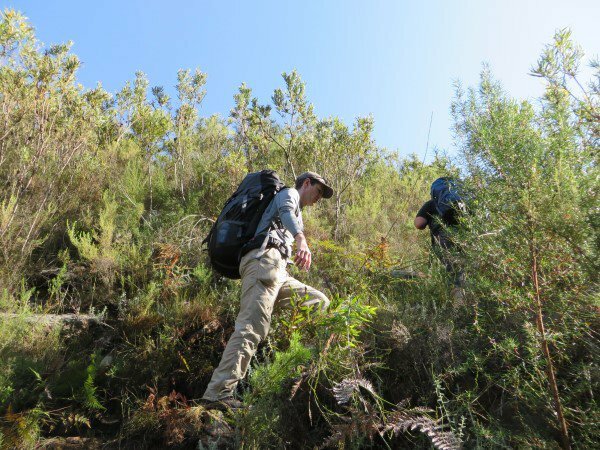 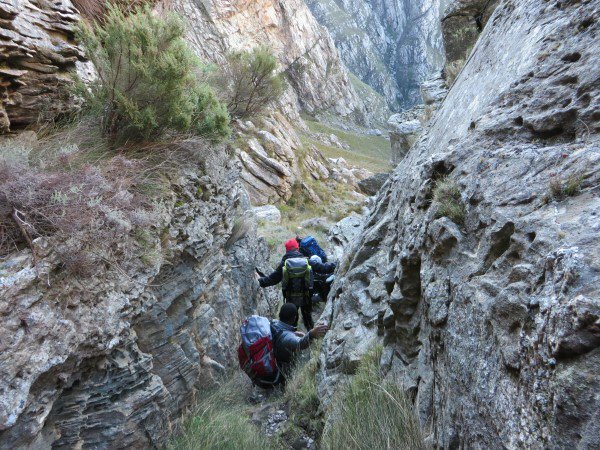 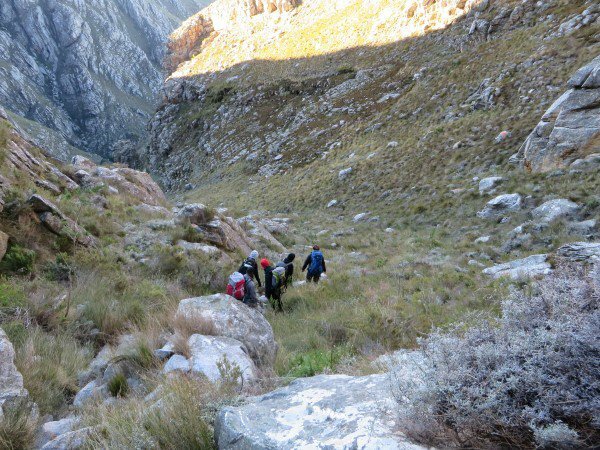 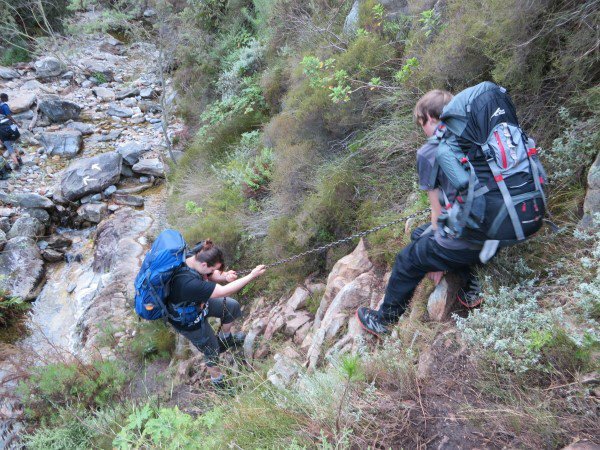 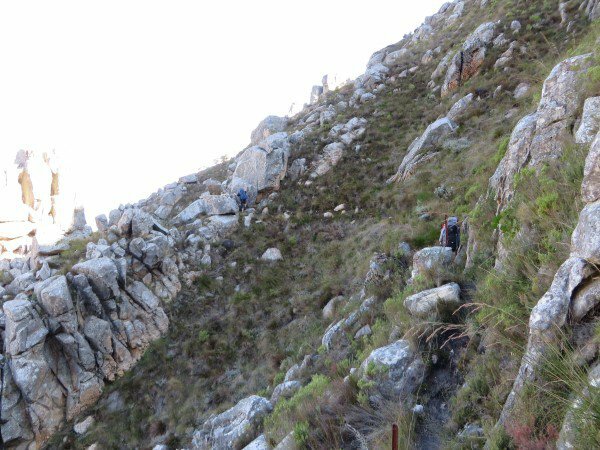 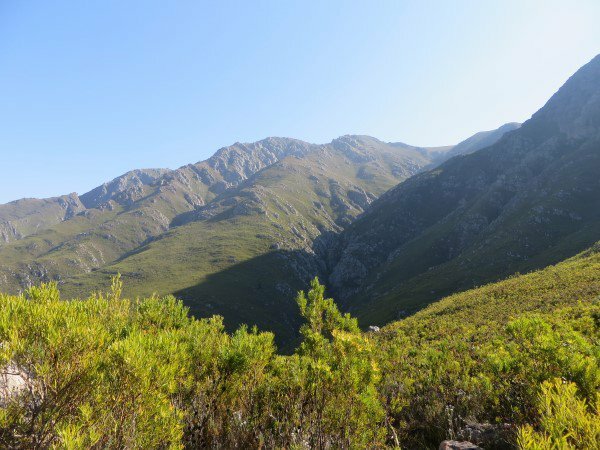 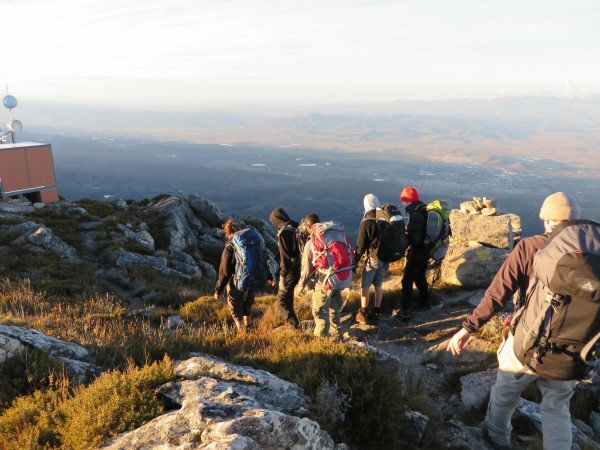 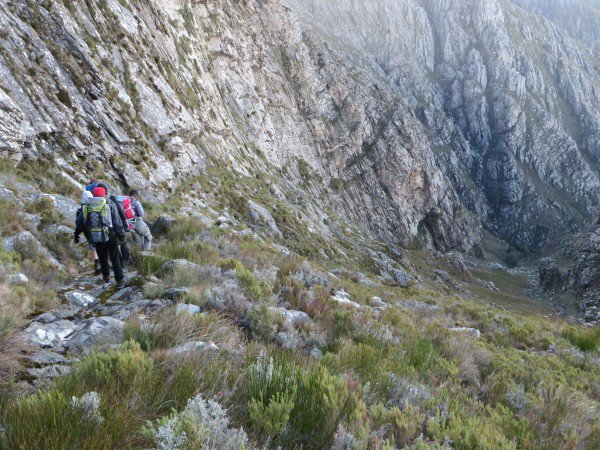 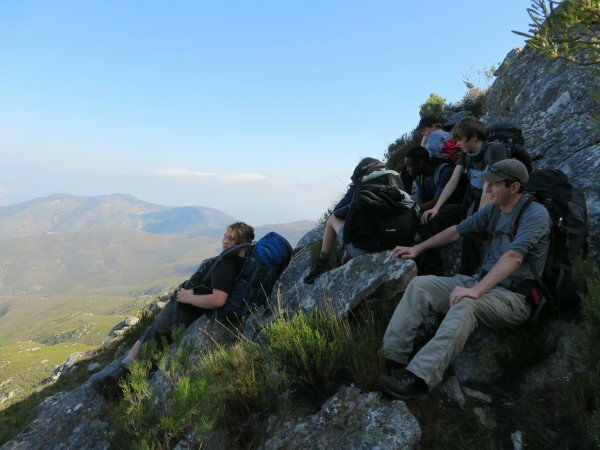 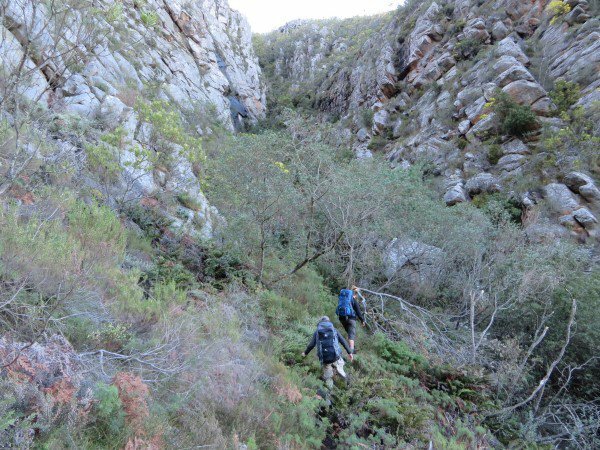 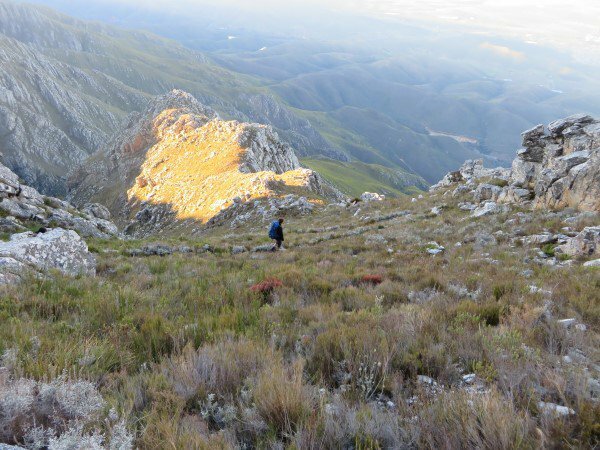 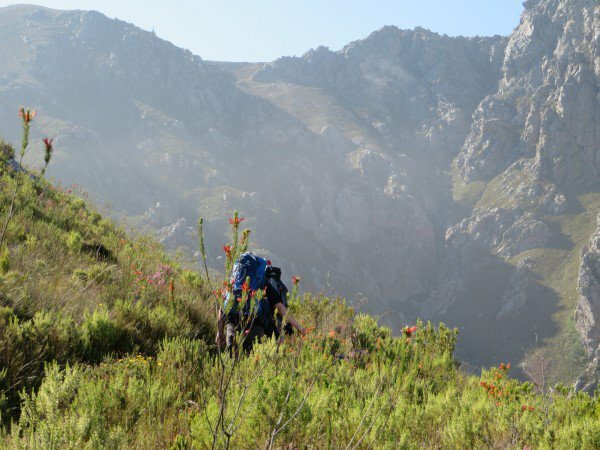 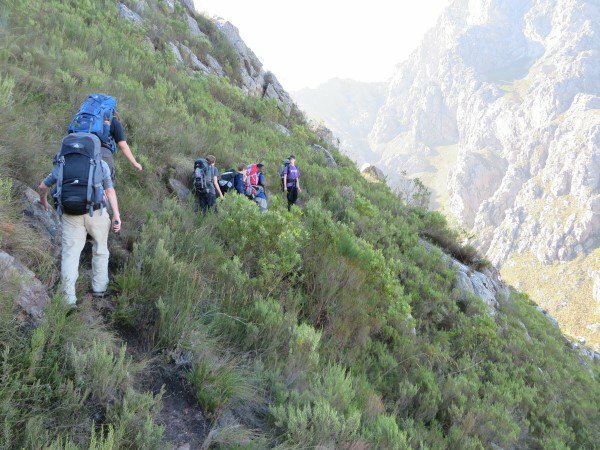 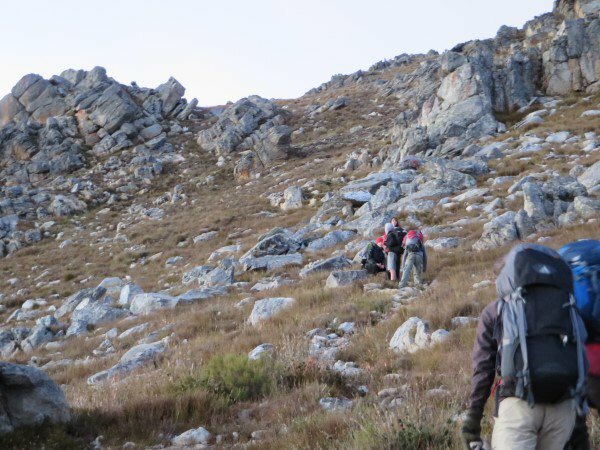 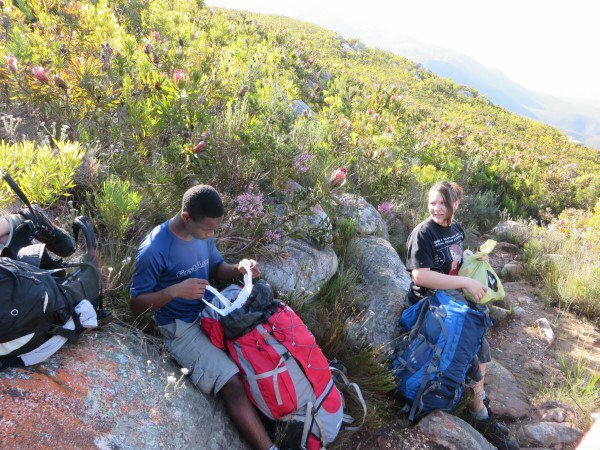 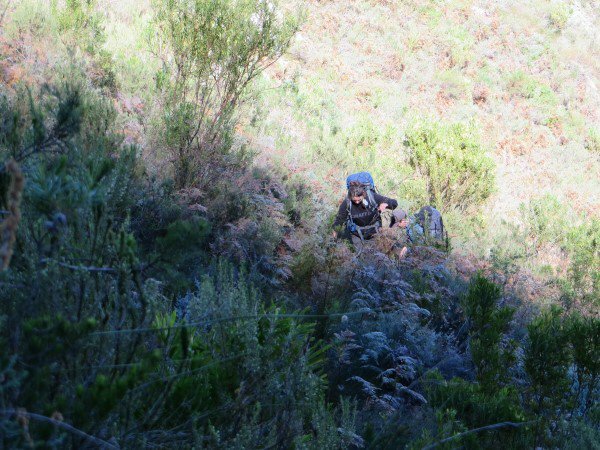 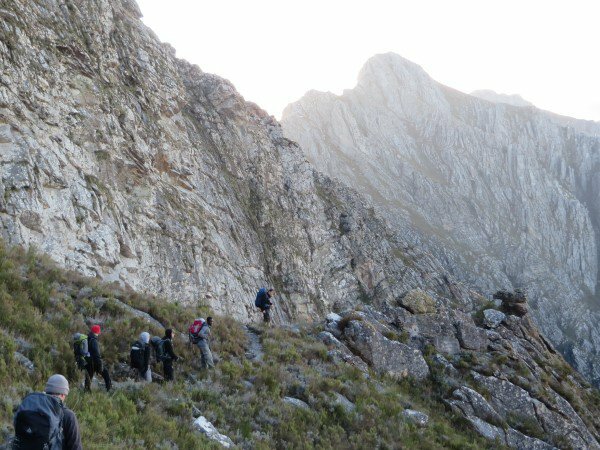 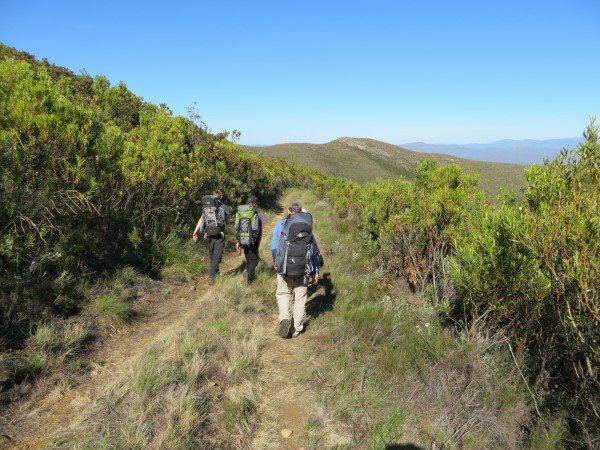 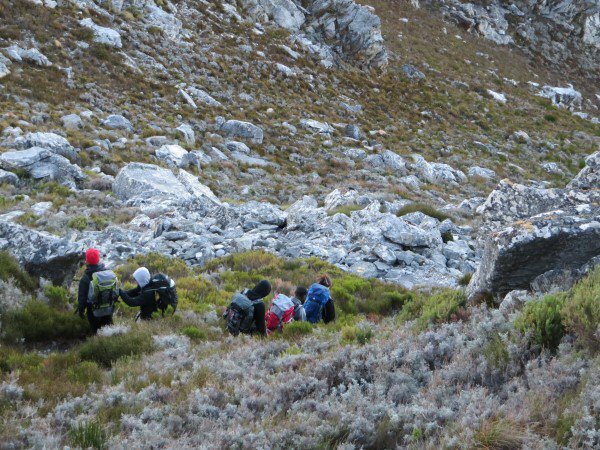 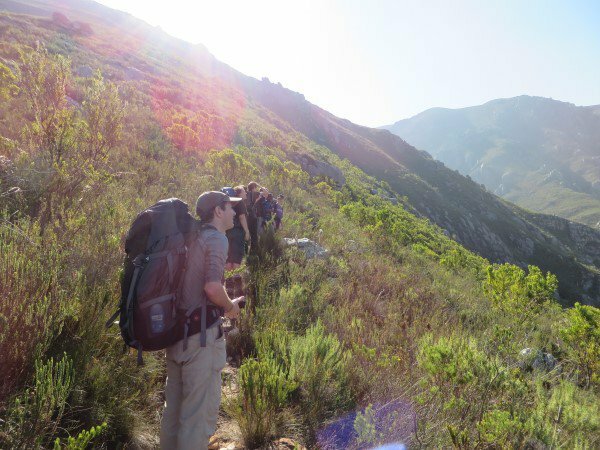 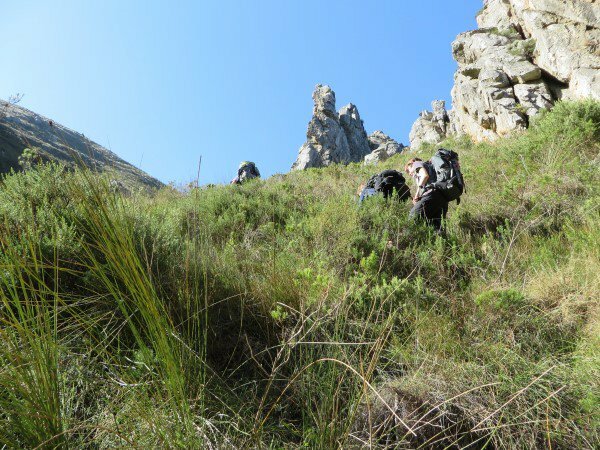 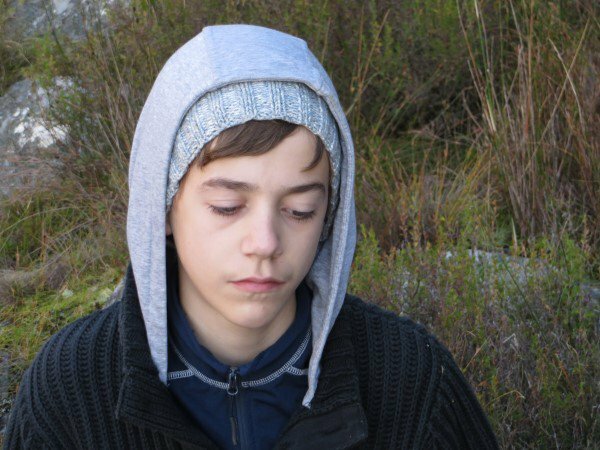 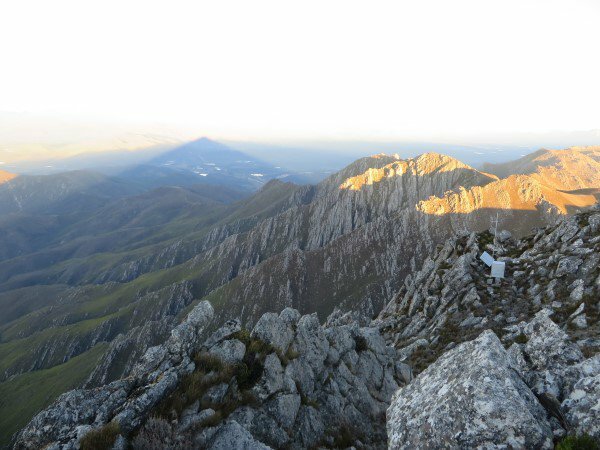 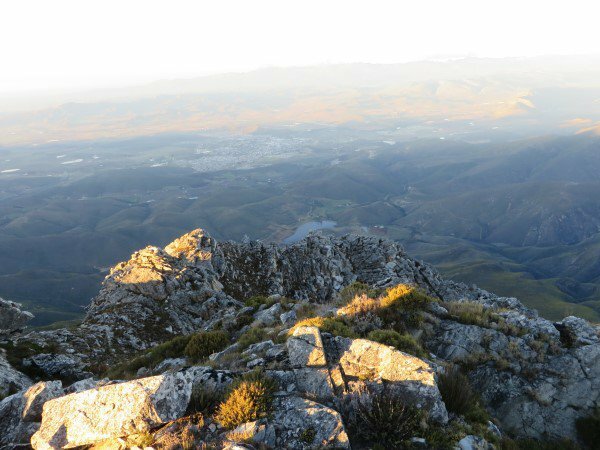 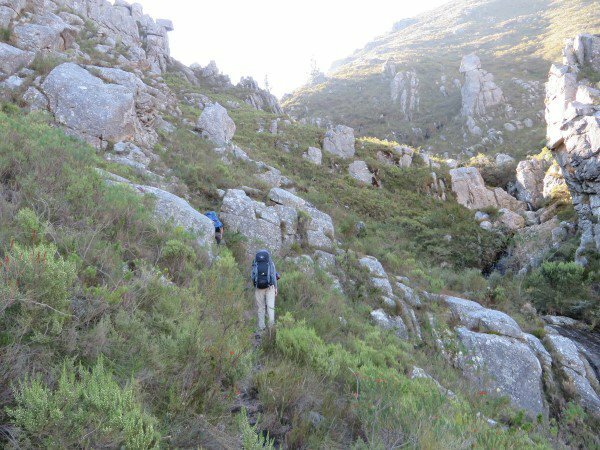 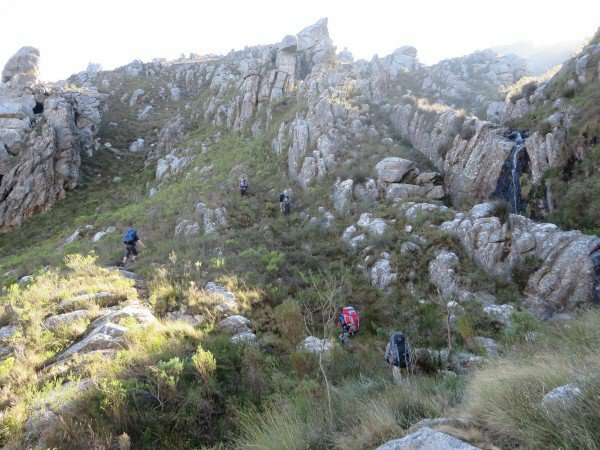 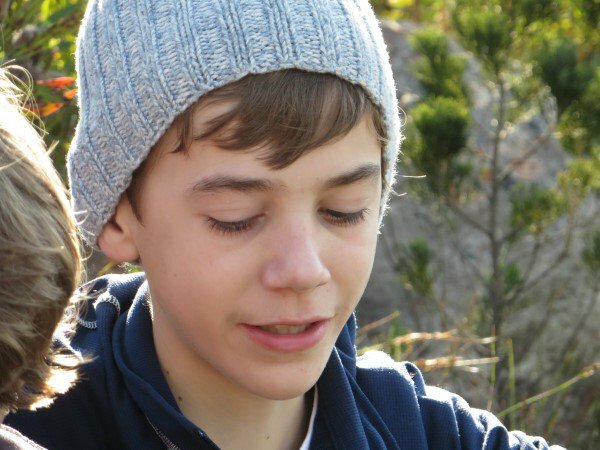 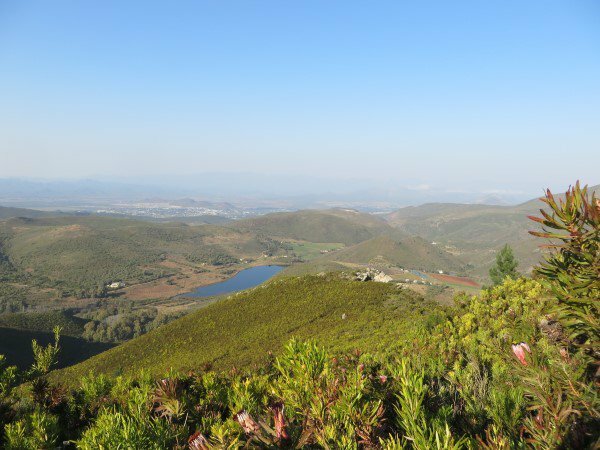 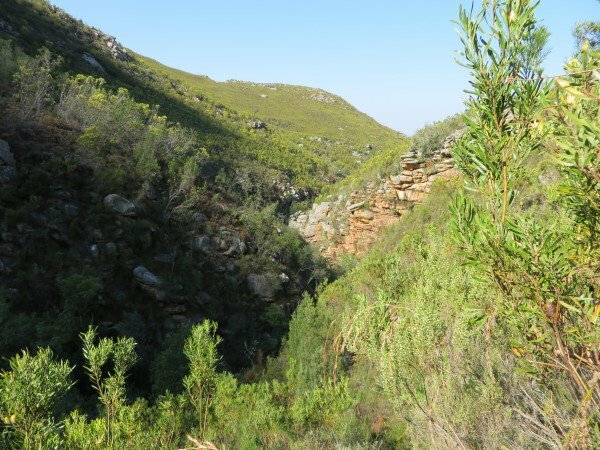 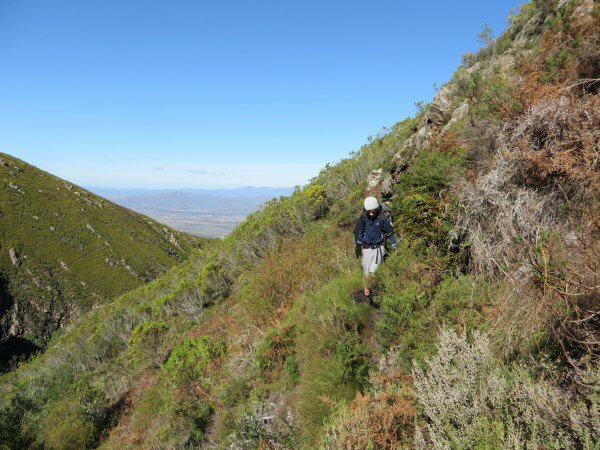 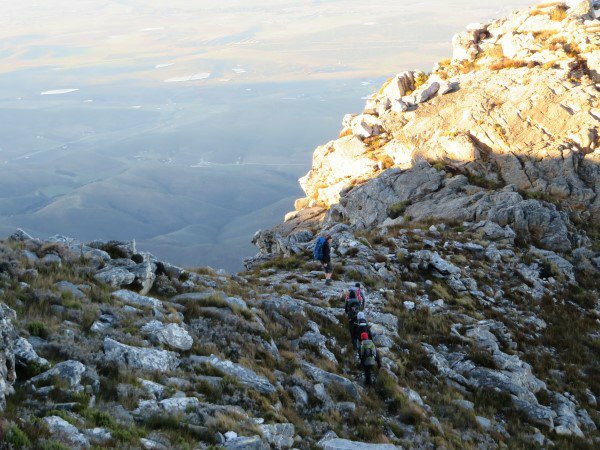 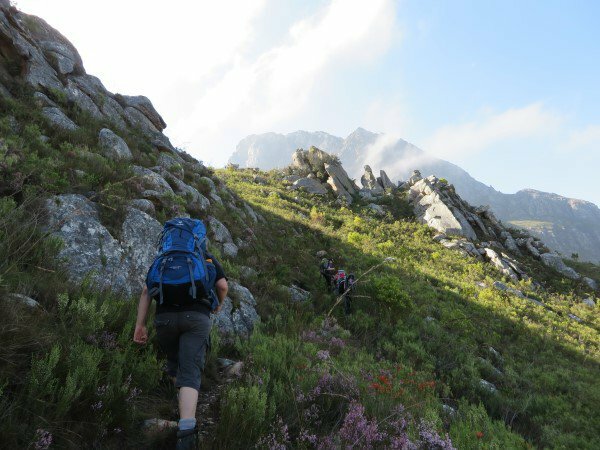 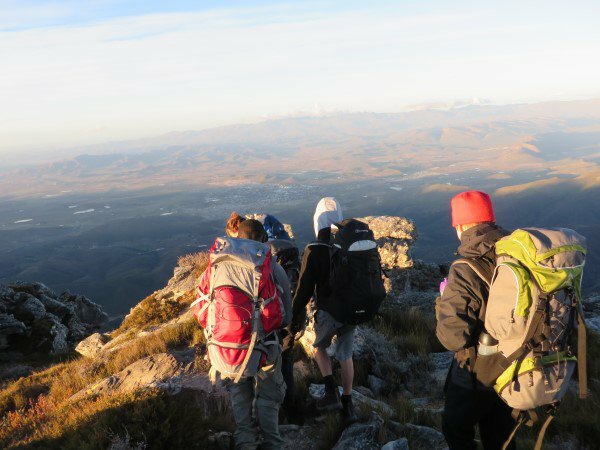 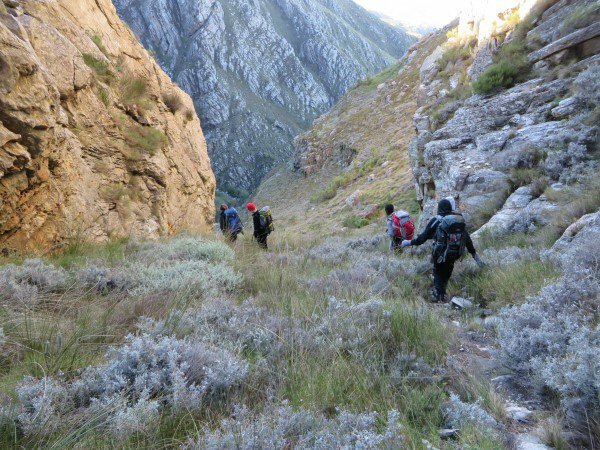 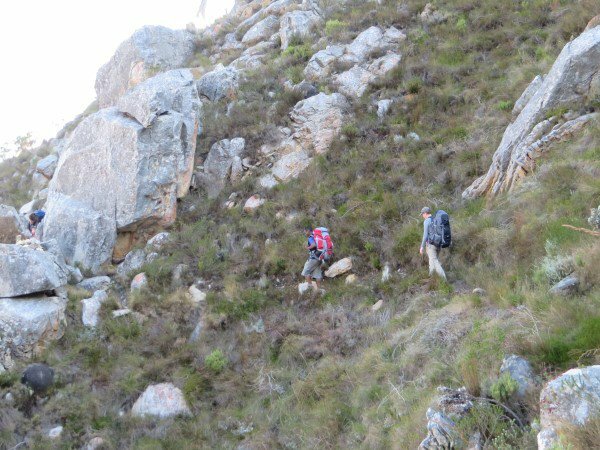 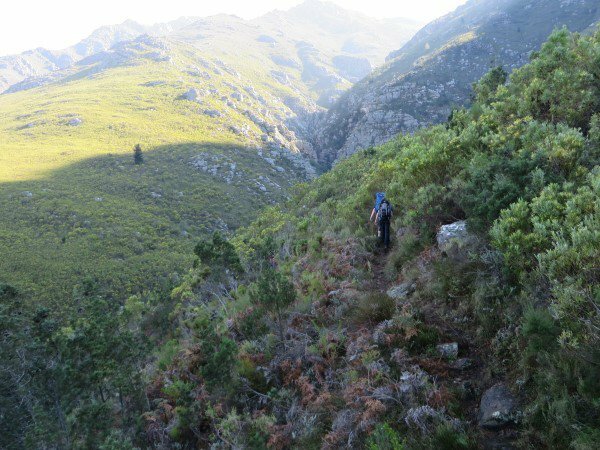 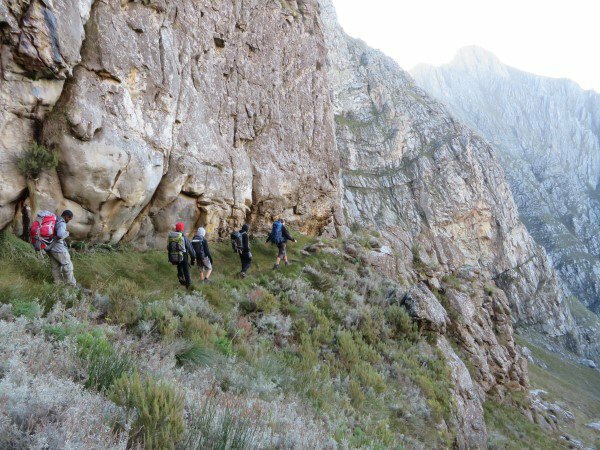 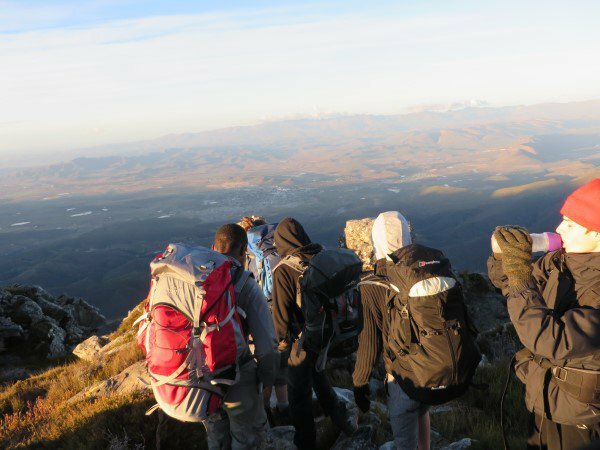 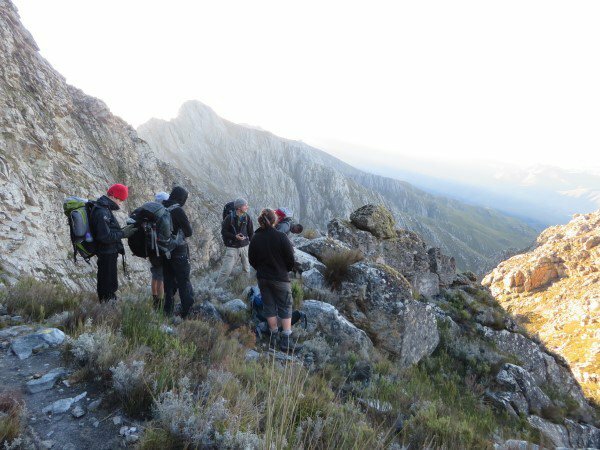 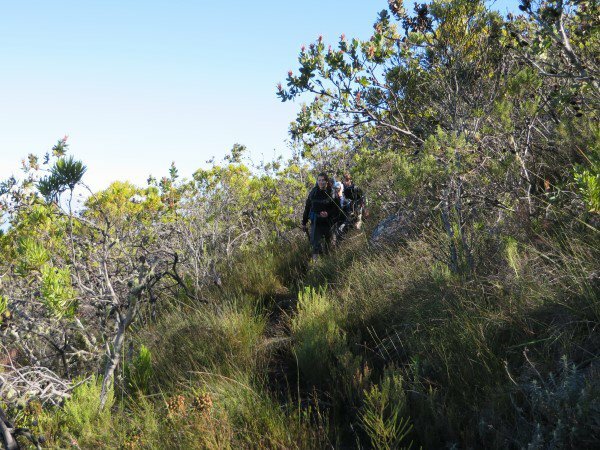 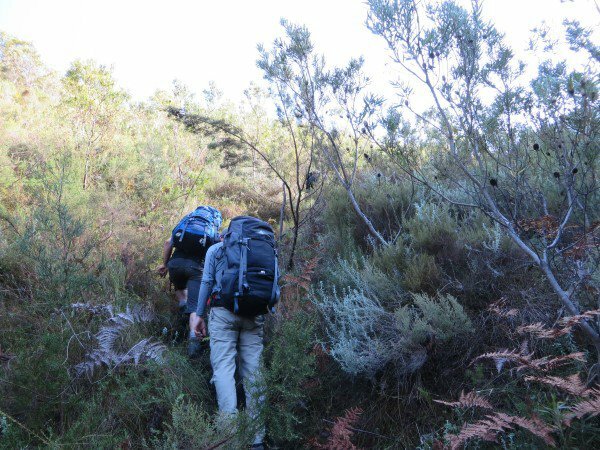 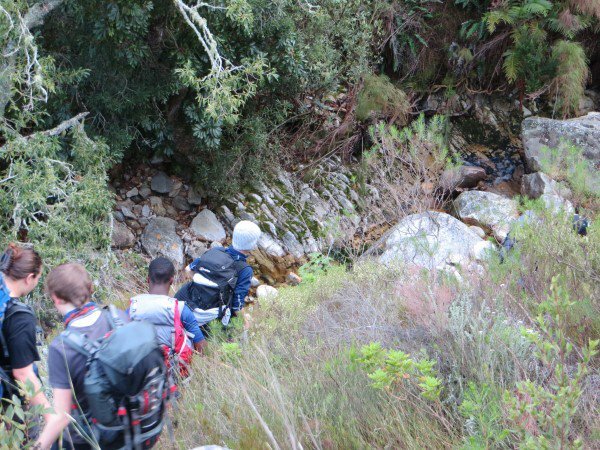 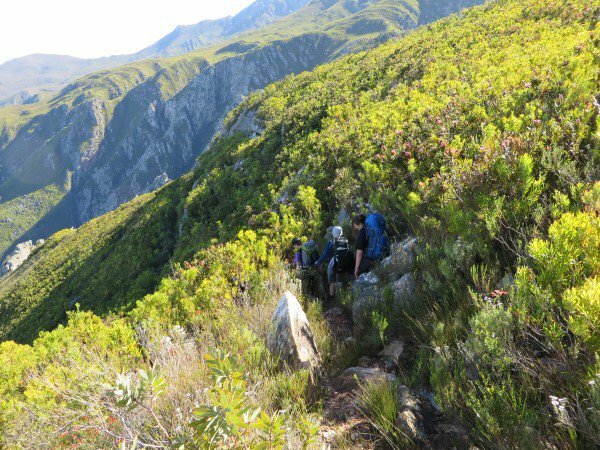 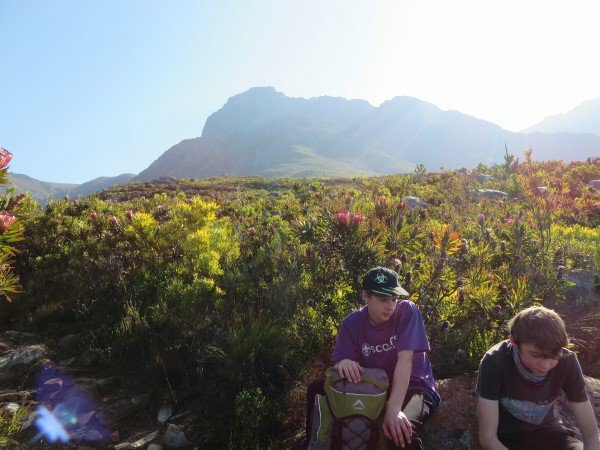 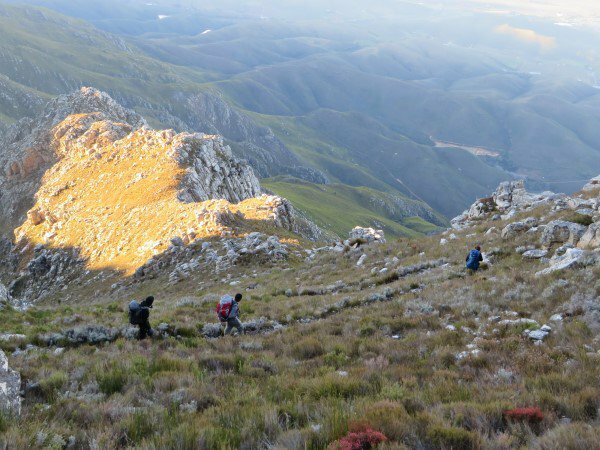 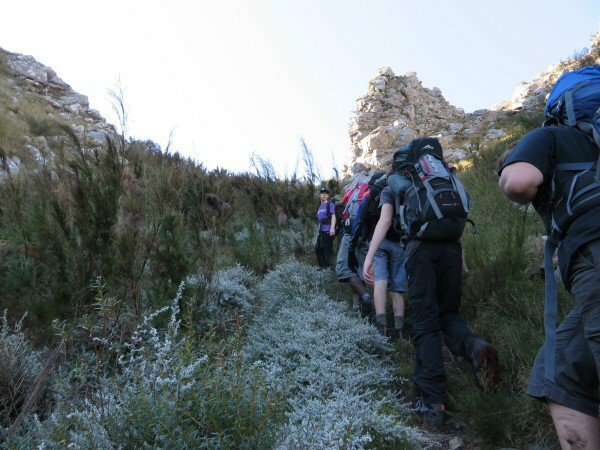 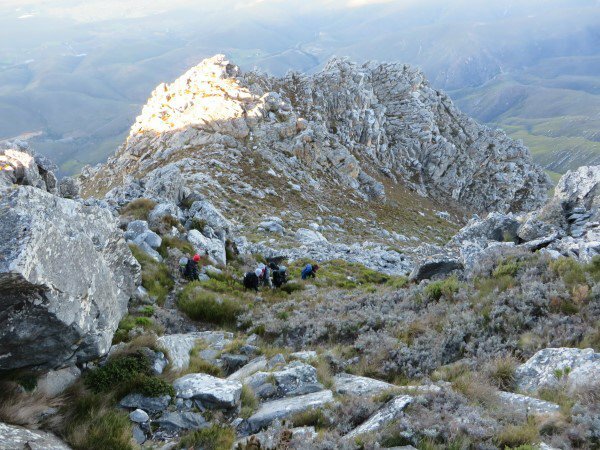 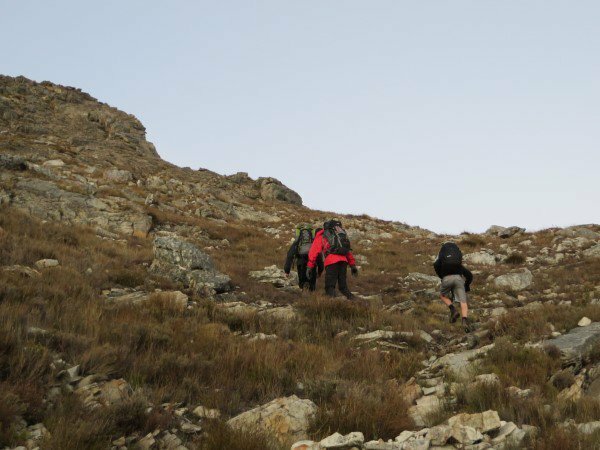 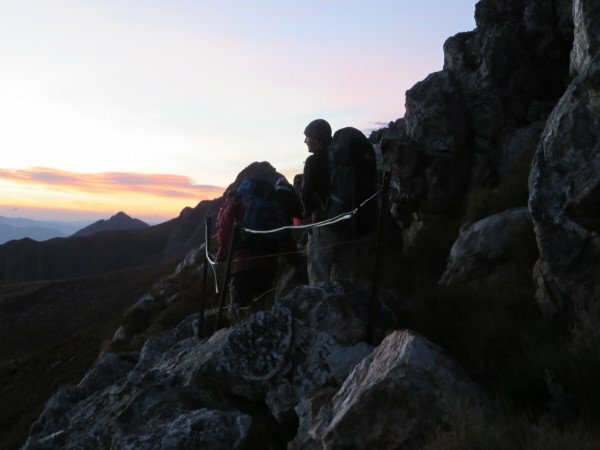 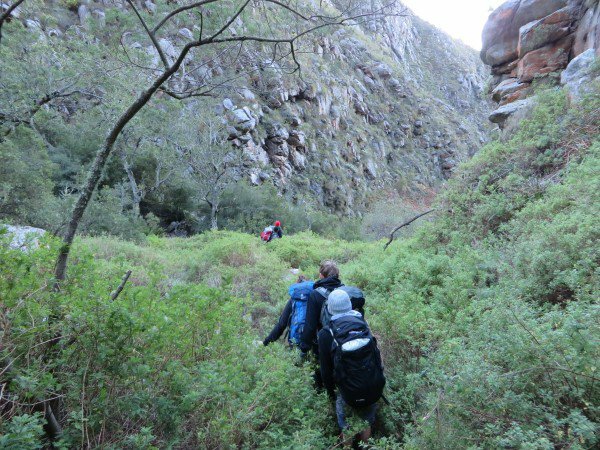 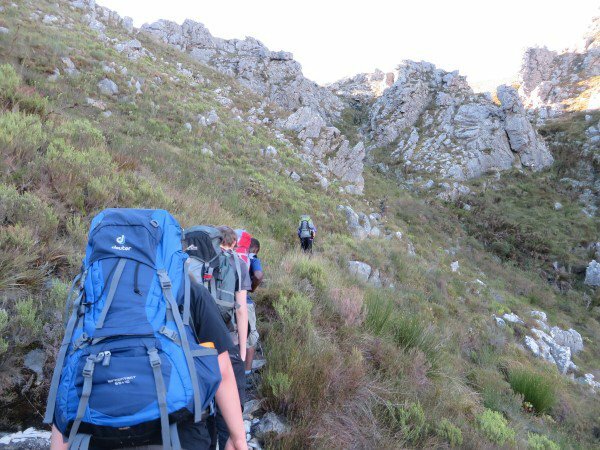 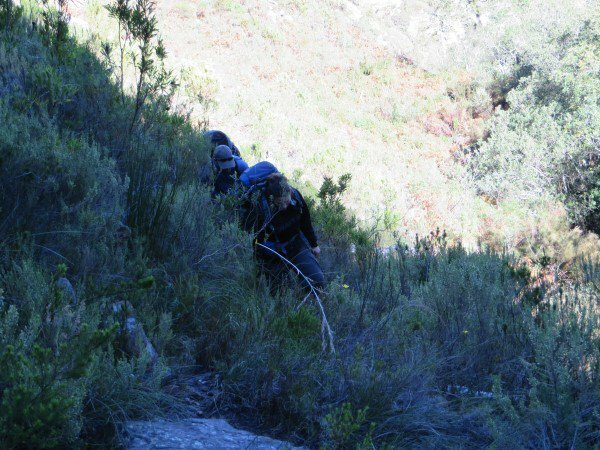 The most tricky part was in the Rooiels forest where the path runs along a sharp drop and is barely a path, leaving everyone a little nervous and some more than a little. 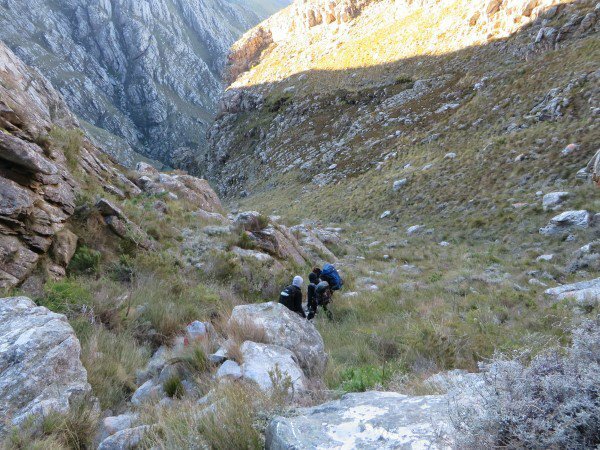 The most demanding parts were the unexpected up sections to escape the valley and later on to climb out of a river. 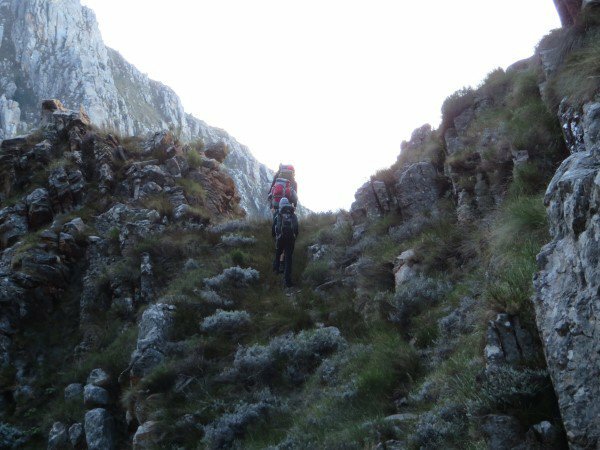 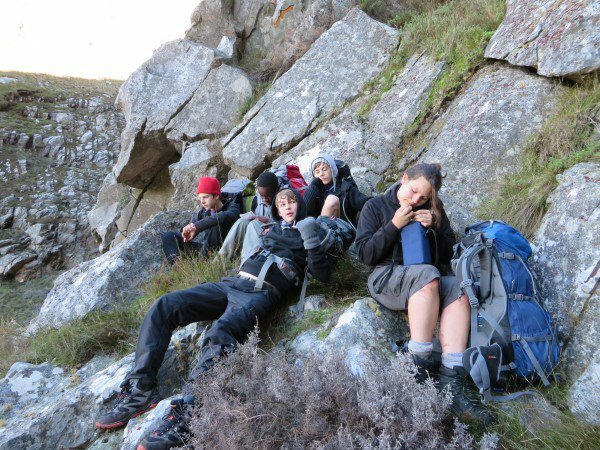 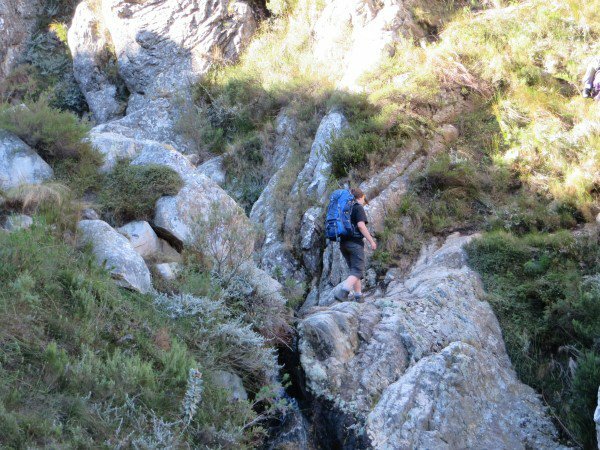 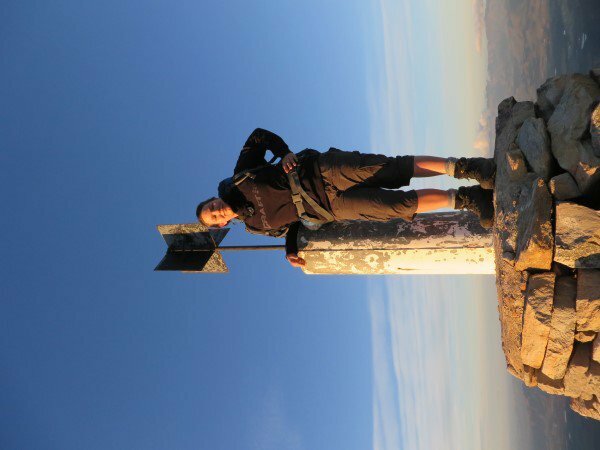 But we all managed it and soon the end point was close – with a steep winding path down, leaving many toes pushing up against the toes of boots to negotiate. 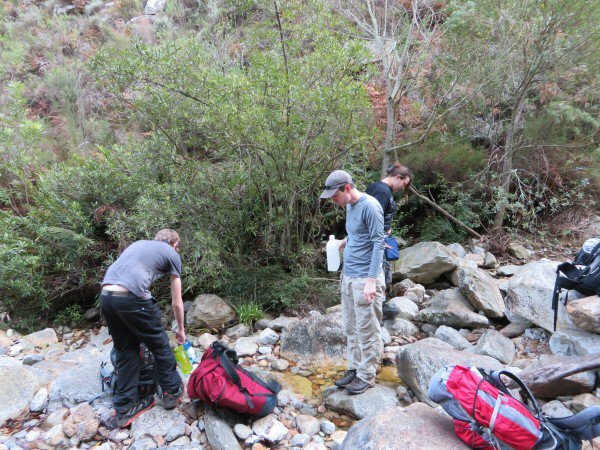 But with the end so close, this was soon mastered and we got to the cars where a welcome can of drink restored spirits.